How often will I need to re-stain my deck? What is the difference between oil based stain and water based stain? Why should I used Renew Crew stain? Answer to question #1, how long will the stain last? Unfortunately, there’s just no way to provide a guarantee for how long a deck stain will last. There are dozens of factors involved when dealing with stain or paint on outdoor decks, fences, patios and even furniture each of which can influence the stain’s longevity. Keep in mind your outdoor living space is exposed directly to sunlight’s UV rays during summer and during winter is exposed to extremely cold temperatures you use your space. Also, take into consideration your space’s exposure during the spring and fall and also how often your space is in use. These are all factors that can influence the longevity of the stain. Because we use an organic product being applied to an organic material, such as the wood on your deck or fence, you can expect a different reaction every time. Renew Crew cannot guarantee your stain or paint will last 5 years or more. If any other company claims they can guarantee their stain during a specific timeframe they are misrepresenting their brand because no product can guarantee such a thing. Answer to #2, how often will I need to re-stain my deck? This is also one of those questions that we can’t guarantee a definitive timeframe because just as stated above; with organic material (wood) and every deck or fence will have a different reaction. You may have noticed this before in and around your neighborhood. For example, you and your neighbor decide to build a deck at the same time and you purchased your lumber from Home Depot and your neighbor purchased his/her from Lowes. Both of you purchased pressure treated pine and you both decide to stain the deck the same color using the same brand product. Upon completion both decks look exactly the same but, as time goes by you start to notice the your neighbor’s deck is fading much quicker than yours and after one year his deck already need to be re-stained and yours still looks good. Over a two-year period, your neighbor has stained his deck twice and you are ready to have yours stained for the first time!. Does this mean that your neighbor did something wrong? Absolutely not. The wood on his deck just reacted differently to the stain than the wood on your deck leaving his deck requiring more frequent attention than yours. Here at Renew Crew of Charlotte, we have the solution for homeowners that may have a deck that requires more or less attention — our Renew Crew Maintenance program! This program takes the “guess-work” out of knowing when is the right time to maintain your outdoor space in order to keep it looking, and functioning, at optimal performance. Once we have cleaned and sealed your deck we can sign you up to participate in our maintenance program. This means every three months following completion of the initial service one of our experts will inspect your deck to make sure the stain is doing its job, to see if a cleaning or any touch ups are needed. If this is the case, we will schedule accordingly. By paying close attention to your deck, and using this approach, we can keep your deck looking beautiful much longer and save you money over the life of your deck. We care about our customers and strive to enhance their outdoor living experience by taking care of maintenance of your space, so you don’t have to worry about it! Answer to question #3, what is the difference between oil-based stain and water based stain? 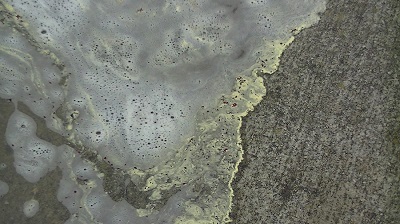 A stain is generally a combination of dyes and pigments and tiny non-dissolving, colored particles which are mixed into a carrier, most often mineral spirits or water. There are few differences between water based and oil based as both stains contain dyes and pigments, but in the case of oil-based stains, they are added to mineral spirits, often called paint thinner, which is a petroleum product. In water-based stains, water replaces the mineral spirits. Traditional oil-based stains have a longer working time, which typically means that from the time you first brush or wipe it onto the wood, you have nearly ten minutes to work with it before it begins to dry. The total drying process takes approximately eight hours, so in most cases you stain one day and apply a finish the next. Water-based stains dry much faster than oil-based stains. You may only have two or three minutes to apply the water-based stain before it begins to get tacky, so it is always best to work in small sections, especially until you are comfortable using it. One major advantage of using water-based stains is that you can stain and finish your project in the same day. One of the best aspects of water-based stains is they emit no dangerous fumes. If you are sensitive to oil-based fumes or cannot adequately ventilate your work area, you should opt for water-based products. Answer to #4, why should I used Renew Crew stain? Our Stain delivers several benefits; first, it literally “seals” your deck pores from moisture and precipitation, preventing water damage to the wood.In addition, our stain is very effective against mold, mildew, and rot. Damp wood fibers provide the perfect environment for mold and mildew to grow and thrive; a sealant guards against both by repelling moisture and creating a physical barrier. By “sealing off” the fibers it makes them impenetrable to harmful organisms. Additionally, at Renew Crew, we use a semi-transparent sealant that shields your deck from the sun’s harmful UV rays, which causes wood to turn an unsightly gray color over time. We believe one of the best things about having a wooden deck is to enjoy the natural beauty of the wood — don’t you agree? By using a semi-transparent stain for deck sealing Renew Crew provides quality protection while still letting the wood’s beauty shine through! Answer to #5, how long does it take to dry? Drying times of all wood finishing products will be affected by the relative humidity and the air temperature in your work area. In short, the higher the humidity or the lower the temperature, the longer it will take to dry. Be sure to read the label of any product you use and follow the manufacturer’s recommendations for application. Avoid working in direct sunlight, for the rays of the sun can draw moist air out of the wood and into your stain or finish in the form of bubbles. If your existing deck is in need of a makeover or if you are interested in keeping your new deck or wooden outdoor structure looking new, give us a call for a free consultation at 704-445-3210 or send us an email at [email protected] to learn more about all the exterior the surfaces we clean and renew through our proven cleaning and restoring process. Why Call Renew Crew for Your Deck Cleaning & Staining Needs in the SouthPark Area? If your deck or patio is looking a little, shall we say, “old”, you may not need to entirely replace it! In fact, our specialty at Renew Crew of Charlotte is to revitalize outdoor surfaces that have signs of discolorment from years of exposure to the elements. If you’re searching for a quality company for pressure washing and staining your SouthPark deck or patio, give us a call before you replace your deck. We’ll let you know exactly what can be done and what results you can expect. Call today at 704-445-3210! No matter how old your deck is, you can always count on the local professional deck cleaning and staining experts at Renew Crew of Charlotte to fully revitalize it. We offer a proprietary cleaning solution that’s engineered to bring all discoloring agents in your deck’s wood to the surface, We’ll then further agitate these through brushing and scrubbing. Next, we’ll gently rinse those discoloring agents away. It’s important to note that we will only use the appropriate amount of water pressure when cleaning your deck. Too high of pressure can completely ruin your deck’s wood surface. Lastly, we’ll stain your deck once it’s dried and this will protect it from water, dirt, grime, foot traffic and UV rays to keep it looking gorgeous. Your deck is most likely your family’s gathering spot during the spring, summer and fall afternoons and evenings. Why allow it to remain an eyesore? Replacement isn’t an absolute necessity. Additionally, fully replacing your deck can be an enormous expense. Make sure to get a second opinion on the state of your deck. 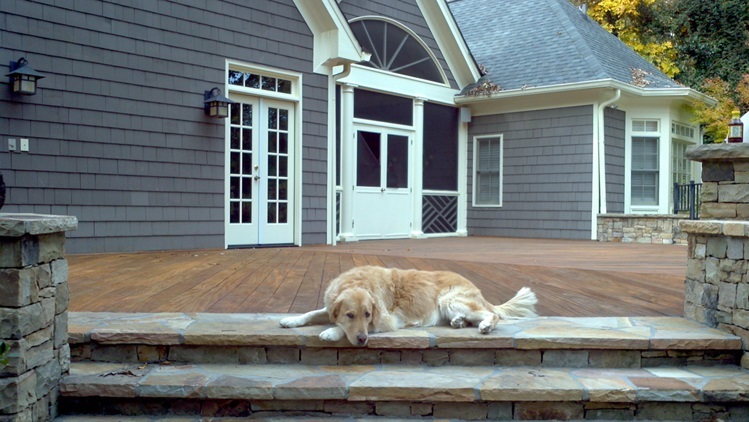 We’ll provide you with all available options to renew your deck’s appearance. We’re not just “two guys and a pressure washer”. We’re a nationally-backed deck cleaning and staining company with a proven process to bring your deck back to life. Call Renew Crew of Charlotte today to get your free estimate on deck cleaning and staining in the SouthPark area of Charlotte. You can reach us by calling 704-445-3210 or emailing [email protected]. We look forward to hearing from you soon! Renew Your Charlotte-Area Deck, Patio and Pavers Before Spring Arrives! Now that we’ve reached February, there are only a few short weeks until we’ll begin seeing temperatures warming up! Sure, we may have an anomaly here or there and possibly even see the debilitating snowfall that will surely shut down the city. But, now is the perfect time to have your deck and patio renewed by Renew Crew of Charlotte. We’ll inspect your deck, patio, and pavers to find out exactly what you’ll need in order to have them looking brand new in time for your spring and summer outdoor get-togethers. If you’re looking for a deck cleaning and staining company in Charlotte, NC, and surrounding areas, call us today at 704-445-3210! If it’s been years since you’ve had your deck or patio cleaned, stained and sealed, then it’s most likely overdue. As the premier deck cleaning, staining, and sealing company in Charlotte and the surrounding areas, we’ll bring your deck back to life and leave it looking better than new. In fact, after just step one of our 3-step process, your deck’s wood will look as though it just arrived from the lumber yard. That’s precisely how effective our cleaning solution is. Remember, it doesn’t take brute force to remove discoloring agents from your deck, and that brute force, high-pressure cleaning may actually harm your deck’s surface. We’ll take the time to fully agitate all the discoloring agents on your deck’s surface and we’ll then continue to scrub them away. Our proprietary cleaning solution is gentle on your deck’s wood, yet will completely remove your deck’s discoloring agents that have become embedded in the porous surface. After we’ve agitated the discoloring agents (i.e. dirt, grime, mold, foot traffic wear, etc. ), we’ll then gently rinse them away using the correct amount of water pressure. This is the key area where we differ from other deck cleaning companies. 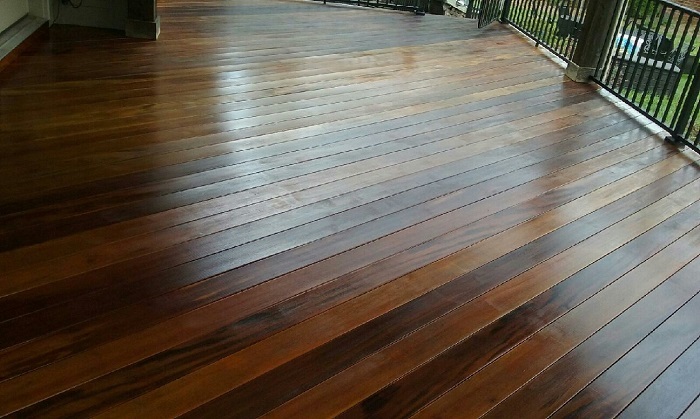 Lastly, we’ll stain your deck utilizing a gorgeous colored stain (of your choosing) that will also continue to protect your deck from dirt, grime, mold, water and even UV rays. So, if you’re looking for a company to transform your outdoor living areas’ surfaces before springtime arrives, simply call Renew Crew of Charlotte today at 704-445-3210 or email us at [email protected]. We look forward to hearing from you soon! Have Your Cornelius Deck Looking Spectacular in Time for Spring Outdoor Living! As we settle into our Carolinian hibernation for another month or two, now’s actually a great time to start thinking about what home improvement projects you want to tackle once warmer weather arrives. If you’ve lived in the Cornelius area for long enough, you know that we may begin experiencing springtime weather as early as the beginning of March! If your deck or paver patio is looking years older than its true age, then it’s time to call the professional exterior cleaning experts at Renew Crew of Charlotte. Call today at 704-445-3210! Unlike other deck cleaning and staining and patio cleaning and sealing companies in the Cornelius area, we have a 3-step process to ensure your outdoor living areas look as good as new by the time we’ve completed the work. We don’t use harsh chemicals or extreme, high-pressure washing to achieve a gorgeous outcome, either. Through the use of our proprietary cleaning solution, we’ll be able to soak your deck and cause all the discoloring agents to rise to the surface. We’ll then scrub the deck to further agitate those discoloring agents before finally rinsing them away with the appropriate amount of pressure. After we’ve removed the discoloring agents from your deck, the wood will look nearly brand new, as though it’s just been put down from the lumber yard. Next, we’ll apply our custom sealant that comes in a multitude of colors; from which you get to select, of course. The “stain” is both a stain and a protectant. It will help protect your newly cleaned deck from water, UV rays, dirt grime, foot traffic and ensure your deck looks great for years to come. After we’ve completed our work, you most likely won’t recognize your deck. Your friends and neighbors will think you’ve installed a brand new deck. That’s how much confidence we have in our work. The before and after is, “night and day”, so to speak. To find out how Renew Crew of Charlotte can bring your Cornelius deck or patio back to life, give us a call at 704-445-3210 or email us at [email protected]. We look forward to hearing from you soon! 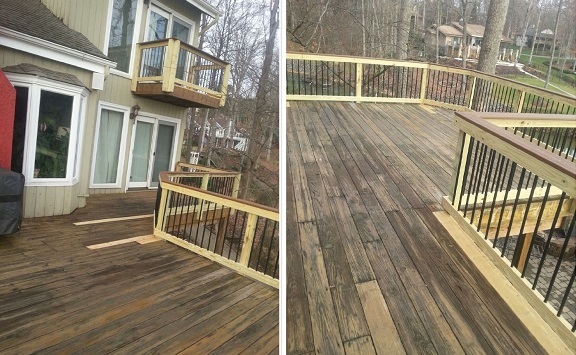 If you’re in search of a company to stain your Ballantyne deck, then look no further than Renew Crew of Charlotte! We’re the area’s premier deck cleaning and staining company and have been for over a decade. If your deck’s appearance looks years and years older than it actually is, then it’s time for a makeover! We offer the most innovative approach to deck cleaning and staining in Mecklenburg and Union Counties. We’re the company to turn to for all your Ballantyne deck cleaning and staining services. Call us today at 704-445-3210! Your deck is most likely one of your favorite places to sit and relax, whether after a long day of work or during the weekend. If you’re tired of looking at a seemingly old, dingy deck, all you have to do is call the local deck cleaning experts at Renew Crew of Charlotte. We offer a free estimate and will show you exactly how and what we can do to bring your deck’s appearance back to gorgeous. Why replace your deck when you can renew it? 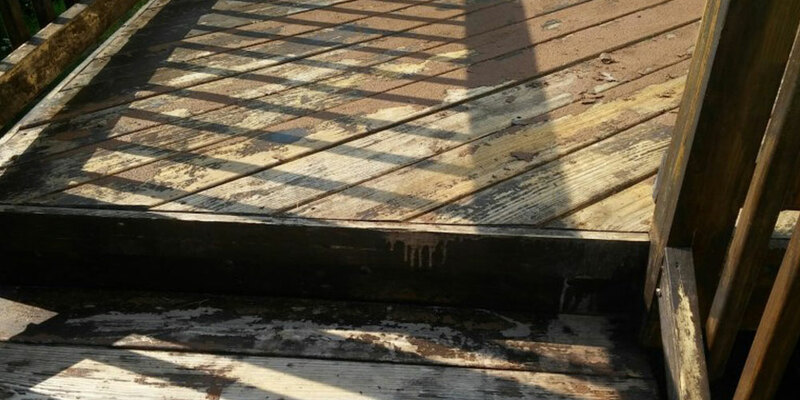 Through the use of our proprietary cleaning solution, we’ll remove all the discoloring agents that have accumulated on and in your deck to begin the removal process. We’ll next scrub away those discoloring agents and then rinse off your deck’s surface utilizing the appropriate amount of water pressure. Unlike nearly every other deck cleaning company in the Ballantyne area, we don’t use harsh, high-level pressure washing to rejuvenate your deck’s surface. In fact, it’s the primary thing that separates us from other local deck cleaning and staining companies. Don’t forget, deck cleaning companies that use too high a level of water pressure can completely ruin your deck! To find out how Renew Crew of Charlotte can bring your Ballantyne-area deck back to life, call us today at 704-445-3210 or email us at [email protected]. We look forward to hearing from you soon! 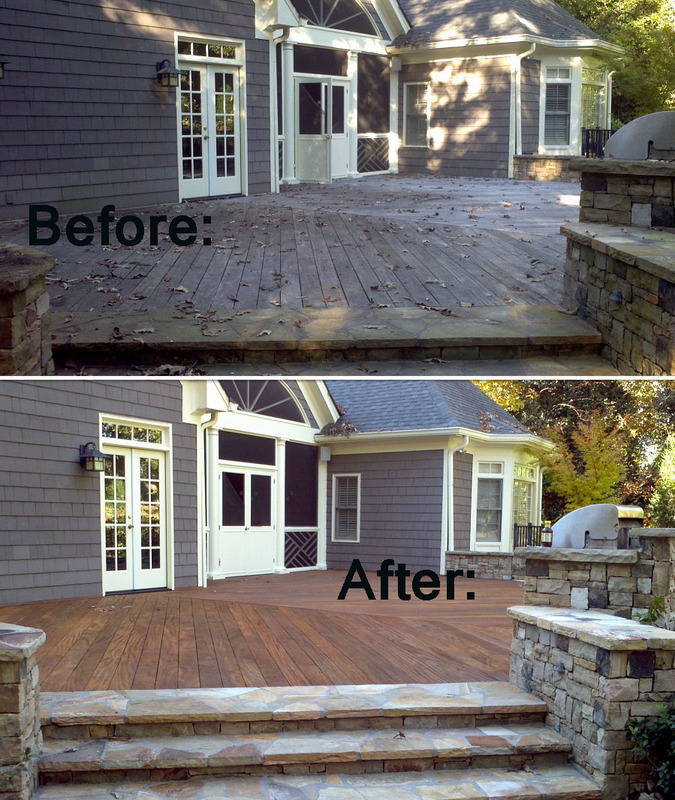 Ring in the New Year With A Fully Revitalized Appearance for Your Deck! Your Charlotte-area deck takes a real pounding, day after day, year after year. If you’re like most people, your deck probably looks years older than its age due to water, dirt, grime, mold and the hot summers we have here. If you’re thinking of undertaking a major pressure washing and staining job yourself, wait! If you use the incorrect amount of pressure, you stand to completely damage your deck’s wood surface. Additionally, you may find yourself putting this job off, week after week. So, if you’d like to bring your deck back to life from its dim appearance, just call the local deck cleaning and staining experts at Renew Crew of Charlotte at 704-445-3210! No matter what shape your deck is in, short of needing boards replaced, we can usually completely rejuvenate its appearance. We use a proprietary cleaning solution that brings your deck’s discoloring agents to the surface and then we further agitate them with a gentle brushing. Second, we’ll rinse your deck off and the results of the cleaning solution, brushing and rinsing will shock you. Your deck’s wood will look like fresh lumber! We’ll then apply a protectant stain/sealant that will make your deck really “pop”, as well as protect it from dirt, grime, water and UV rays. As the premier deck cleaning and staining company in Charlotte, Waxhaw, and surrounding areas of Mecklenburg and Union Counties, we advise you to be cautious before hiring just anyone to clean and stain your deck. We recommend that you never use bleach to remove mold or mildew and make sure the company you hire isn’t using an extreme amount of pressure when washing your deck. By hiring an insured, nationally-backed franchise to handle your deck’s cleaning and staining needs, you’ll have peace of mind knowing we’ll get it right the first time. To schedule your deck cleaning and staining, call Renew Crew of Charlotte today at 704-445-3210 or email us at [email protected]com. We look forward to hearing from you soon! 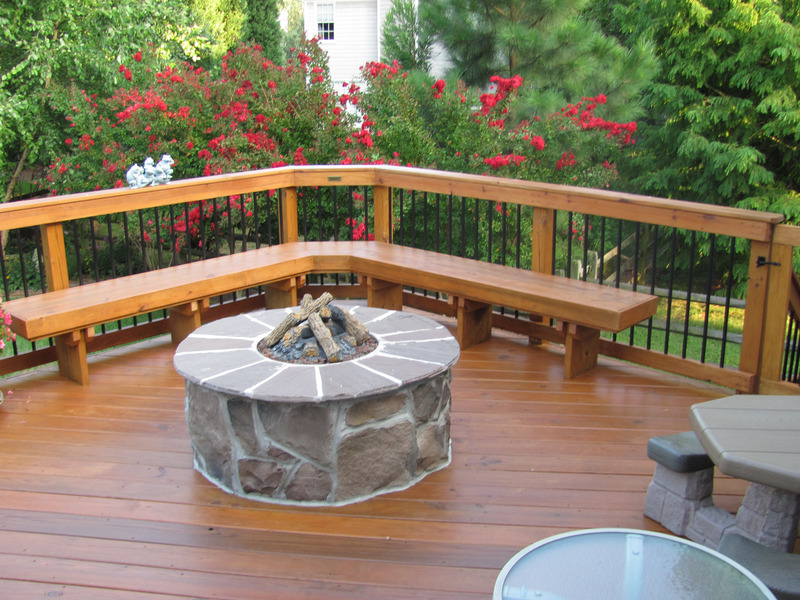 When Planning for Your Coming To-Do List, Consider Cleaning and Staining Your Charlotte, NC Deck! 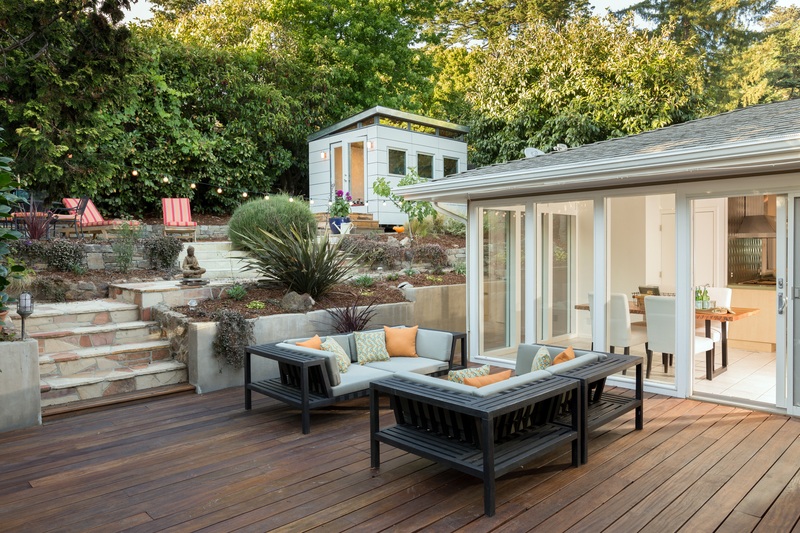 Few of your outdoor living spaces are as large of an investment as your deck. The only problems is that your deck is exposed to the elements 24 hours a day, 365 days a year. In addition to the elements, your deck’s also exposed to high foot traffic and general wear and tear. If your deck is showing signs of aging and has signs of discoloration, relax, and call the local Charlotte deck cleaning and sealing experts at Renew Crew of Charlotte. Through our meticulous 3-step process, we can remove the discoloring agents from your deck and gently brush them away. While there’s a lot of talk about the high-pressure cleaning of your wood surfaces, this is not how we operate. At Renew Crew of Charlotte, we understand that using too high of a pressure on wooden surfaces can damage your outdoor surfaces. We will have your deck looking nearly as good as the day it was built. Make sure to perform your due diligence when hiring a deck cleaning and staining company in Charlotte, NC, or it could end up costing you; this applies both literally and figuratively. Once we’ve completely cleaned your deck, next we’ll stain your deck. We offer several different types of deck stain, all of which are elegant and incredibly aesthetically pleasing. In addition to looking great, however, your deck will also receive additional protection from water, UV rays and foot traffic through proper staining and sealing. After all, the reason your deck has come to look old and grey is due to water, UV rays and foot traffic. So, if you’re going to have your deck cleaned, it’s quite necessary to seal your deck as well. To find out why Renew Crew of Charlotte is the most trusted name in deck cleaning in Charlotte, NC, call us today at 704-445-3210 or email us at [email protected]. We look forward to hearing from you soon! If your Waxhaw deck looks years older than its actual age, we have some good news. 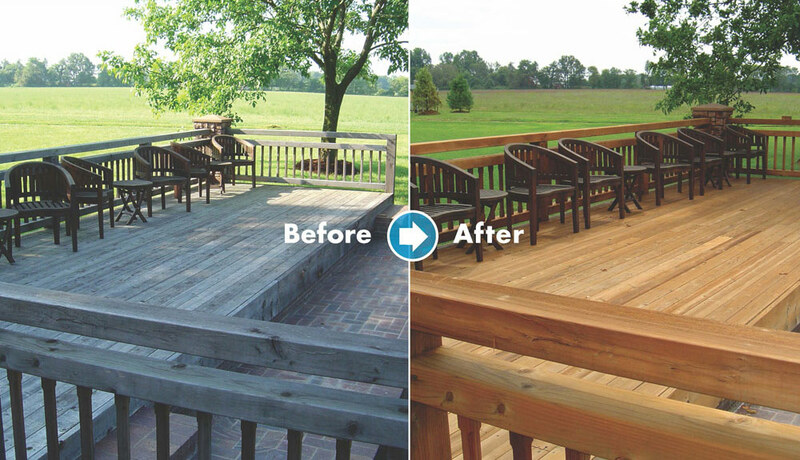 Renew Crew of Charlotte can fully revitalize your deck through our 3-step cleaning process and bring it back to life with our protective deck stain. While there are plenty of pressure washing companies out there, wouldn’t you like to know that your deck’s appearance is left in the hands of a nationally-backed franchise that’s been performing deck renewal services for over a decade in Mecklenburg and Union counties? All you have to do to set up your free estimate is call us at 704-445-3210! While you may think all deck cleaning and staining companies in Waxhaw are the same, they are not. In fact, before you hire a company to clean and stain your deck, make sure to perform your homework. Make sure you check their longevity in the area, their licensing and insurance and check what others have to say about them. You should check both local referrals and online reviews. Simply put, if you hire the wrong company, you may end up having your deck’s surface completely ruined. Using too high of pressure on your deck’s surface can destroy the wood’s surface, making it nearly impossible to seal without a complete overhaul. At Renew Crew of Charlotte, we utilize a cleansing solution that will seep into your deck’s pores and will bring the discoloring agents to the surface. Next, we’ll agitate those discoloring agents with a specialized brush. 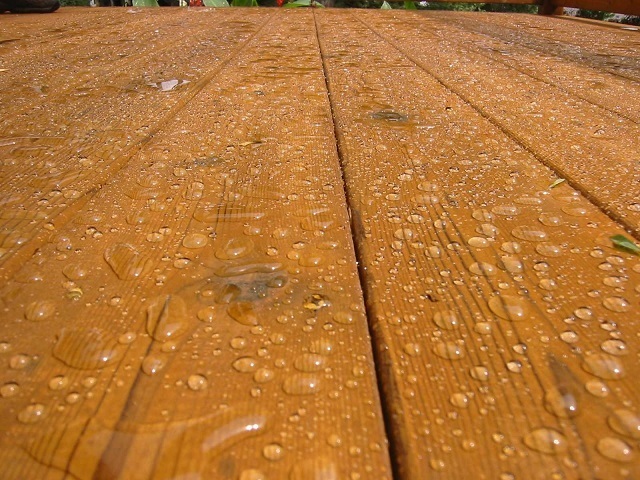 Once the solution has performed its task, we’ll then gently rinse away all the discoloring agents on your deck. Lastly, we’ll wait until your deck is completely dry and then we’ll apply our protective, gorgeous deck stain. This stain serves dual purposes; it will increase the appearance of your deck and will protect it from other discoloring agents such as water, dirt, leaves and UV rays. The protective sealant will keep your deck looking great for years to come! So, make the right choice and call the professional deck cleaning and staining experts at Renew Crew of Charlotte. To find out how Renew Crew of Charlotte can bring your old, dingy deck back to life, just give us a call at 704-445-3210. We look forward to hearing from you soon! If you’ve gone out to your local big-box store and purchased a pressure washer, more than likely, your first thought was to remove all that green and brown discoloration on your deck. So, you have your pressure washer gassed up and all the hoses connected. Now what? With all the different nozzles to choose from, which one do you select? You’re probably thinking you need to go with the second strongest nozzle – and that’s where you made your first, yet costly, mistake. 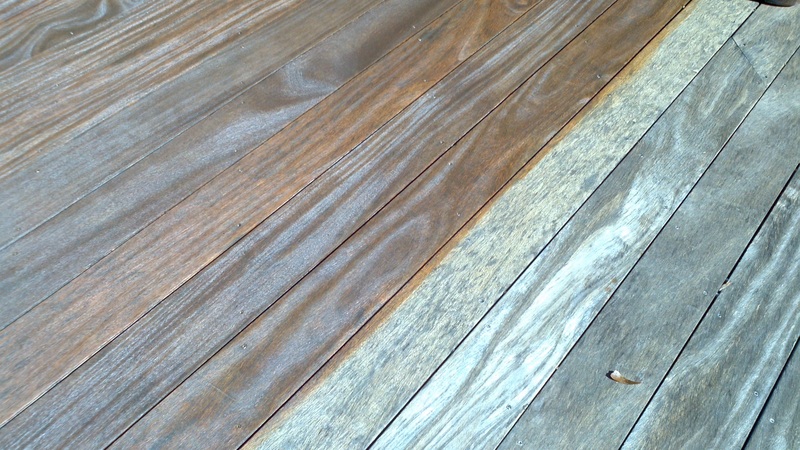 This is the most common mistake that occurs when DIYers attempt to clean and re-stain their deck. You may not know it, but if the pressure is too high, you can completely ruin your deck’s outer layer. In fact, we’ve arrived to some decks that look like they’ve been peeled with a dull blade. 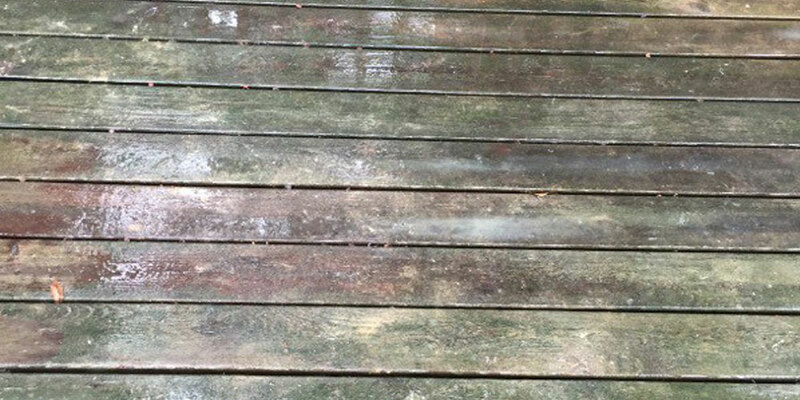 It’s important to make sure that you know how to remove the discoloring agents from your deck, prior to rinsing it off with a pressure washer. It’s even more important to know how much pressure to use on different outdoor surfaces. In fact, you most likely will end up damaging your deck if you set out to pressure wash it without doing your homework. Here’s another bit of advice: those “two guys and a truck” pressure washing crews know just a little more than you do when it comes to pressure washing decks. It truly takes a professional to utilize the correct pressure and still bring the desired results when it pertains to deck cleaning. So, why not just call the professionals at Renew Crew of Charlotte? We’ll bring your greyed out, moldy deck back to life in no time and even add a beautiful stain that acts as a sealant to protect your deck from water, dirt and UV rays. In fact, it’s one of our many specialties when it comes to cleaning outdoor surfaces. If needed, we can perform the same services for your wooden fence, as well. 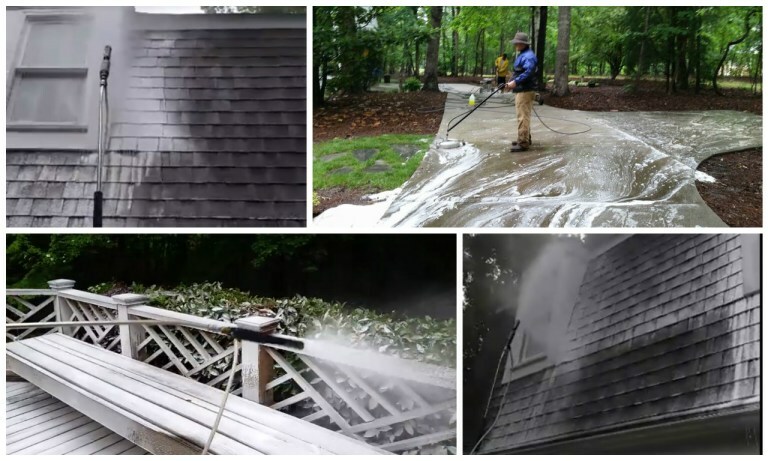 To find out why Renew Crew of Charlotte is the most trusted deck pressure washing company in Charlotte, NC, and surrounding areas, call us today at 704-445-3212 or email us at [email protected]. We look forward to hearing from you soon! 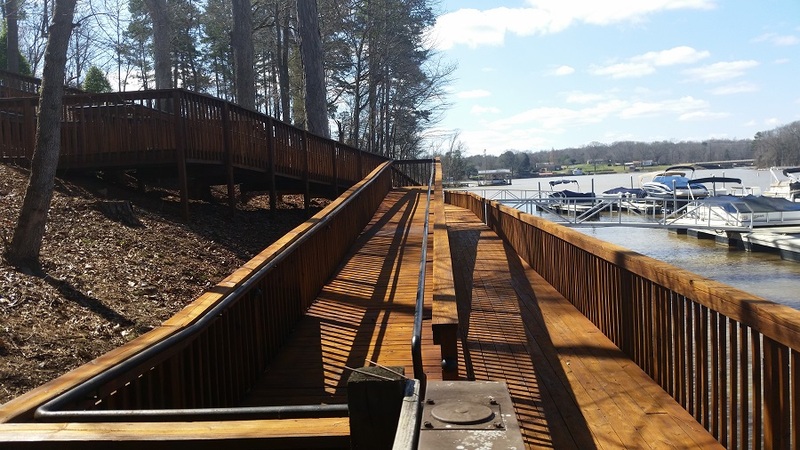 Bring Your Ballantyne Deck Back to Life by Calling Renew Crew of Charlotte! If your Ballantyne area deck is looking years and years beyond its actual age, then it’s time to call the deck cleaning and staining professionals at Renew Crew of Charlotte! No matter how bad you think your deck looks, you’d be pleasantly surprised with our ability to completely revitalize your deck. We utilize a gentle cleaning process and will then stain and seal your deck to keep it looking phenomenal. Call us today at 704-445-3210! Our proprietary cleaning and sealing process is unlike any other on the market. Furthermore, we’re a nationally-backed franchise that is able to deliver much greater results than your local “two guys in a truck”. While you may think that high-pressure cleaning is needed to remove the discoloring agents from your deck, that’s not the case. In fact, we utilize a penetrating foam that will cause those discoloring agents to rise to the surface. Then, we’ll scrub those off and then gently rinse them away. By this point, the wood on your deck will already look practically new. Finally, we’ll apply a protective stain/sealant that will protect your deck from water, dirt, mold and UV rays while also giving your deck a gorgeous new appearance. If you’re looking to replace your deck, that can be a very expensive undertaking. 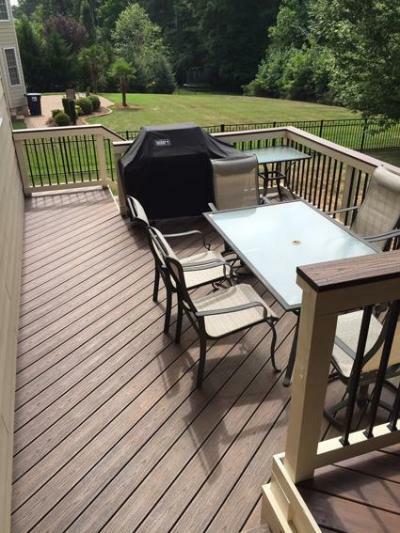 If you’re on the fence, just give Renew Crew of Charlotte a call and we’ll show you exactly what can be done to improve the appearance of your deck, short of replacing it. You can reach us by calling 704-445-3210 or by emailing us at [email protected]. We look forward to hearing from you soon! 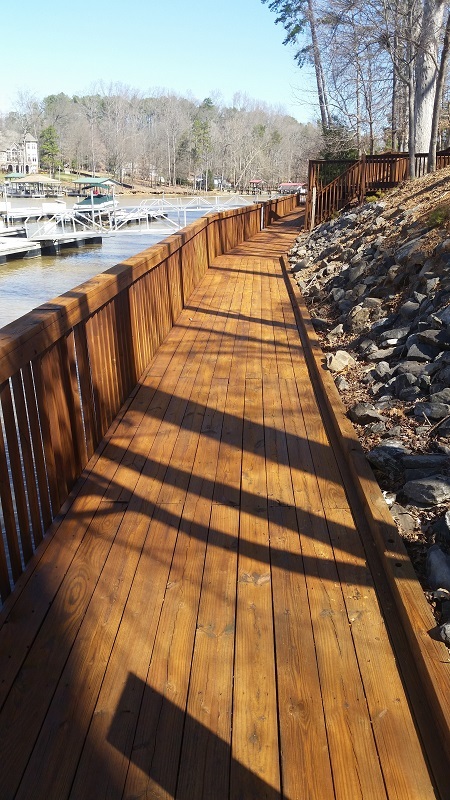 Lake Norman Deck Staining at its Finest! How old does your deck currently appear? Does it look years beyond its actual age? If so, that’s where Renew Crew of Charlotte can help! We specialize in taking decks that are fading and succumbing to the elements and completely revitalizing them. We offer the most thorough and comprehensive deck cleaning and staining services in the entire Lake Norman area. Furthermore, if you need your dock cleaned and stained, we’re the company to call! 704-445-3210! Let’s face it, who wants to rent or buy a pressure washer, fully clean their deck, wait for it to completely dry, and then stain it? It’s a difficult job and one that could result in actual damage to your deck if done incorrectly. That’s precisely why you should leave this type of work to professionals. We know the precise level of pressure to clean your deck. We don’t use harsh chemicals to stain and seal your deck, either. Don’t destroy your deck by using a high-strength pressure washer! In addition to gently cleaning your deck and removing all discoloring agents, we’ll then apply a protectant stain and sealant to make your deck look better than ever before and keep it looking that way by protecting it from dirt, grime, mold and UV rays. Water, UV rays and dirt make the perfect recipe for green mold. You’ve most likely seen it on your deck before. Now that leaves are falling, if you dont’ remove them from your deck, they’ll also result in discoloring marks on your deck. If you’re looking for a reliable, nationally-backed deck cleaning and staining company in the Lake Norman area, call Renew Crew of Charlotte today at 704-445-3210 or email us at [email protected]. We look forward to hearing from you soon! Why is Your Charlotte Deck So Much More Than a Deck? In the early morning, your backyard deck serves as a breakfast nook with fresh air and a view before beginning your busy day. Mid-afternoon, before the bus drops off the kids, it’s the place for Mom to take a quick break with her favorite magazines and refreshing lemonade. Just after school, it’s the best place for your son’s science group to work on their “live action” volcano for the science fair. By evening, the grill is going with burgers for dinner, the table is set and since the volcano is complete, the kids are playing in the yard. Once dinner is finished, the dishes are all cleaned up, the last science group member has been picked up and the bedtime ritual is complete…ahhh. Now it’s time for a nice bottle of wine and some soulful jazz playing softly in the background as you relax and unwind from your hectic day, on the deck… under the stars. See what I mean? And that’s just one day in the life of your backyard deck…that doesn’t even cover the foot traffic and activities the occur during the annual cocktail parties, family gatherings, holiday events, birthday celebrations, pool parties, club meetings and weekly barbecues. All of these wonderful moments with family and friends are the reasons you cherish this incredibly versatile space as part of your home. As such, it deserves the proper care and maintenance to protect it from exposure to the elements, the changing seasons, Father time and everyday wear and tear. Proper deck care and maintenance involve protecting your beloved deck with cleaning and sealing. Renew Crew of Charlotte is the area’s first and only choice for professional exterior surface cleaning and protection. We can clean and protect your deck, making it ready to handle all of your special events and even the most robust everyday use. Renew Crew has perfected an eco-friendly, quality deck cleaning experience through our exclusive 3-step cleaning and sealing process to combat both time and the elements. It starts with pre-soak foam which loosens the grime that has built up on the surfaces. Unlike outdoor cleaners that most pressure washing companies use, ours is environmentally friendly and won’t cause any damage to plants, animals or your home. This is followed by a non-damaging controlled pressure rinse. However, it is our third and final step, which truly sets us apart from other deck cleaning companies. We take cleaning and exterior surface rejuvenation, for your deck, one step further by protecting it to repel harmful outdoor elements, including UV rays. How does your deck look? If you find it in need of renewal or if you are interested in keeping your new deck or other outdoor surfaces looking new, give us a call for a free consultation at 704-445-3210 or send us an email at [email protected] to learn more about all the exterior the surfaces we clean and renew through our proven cleaning and restoring process. Renew Crew of Charlotte is your number one company for hardscape cleaning in Charlotte, NC, and surrounding areas. Unlike most “pressure washing” companies in our area, we won’t utilize harsh, intense water pressure to clean your paver patio or porch. 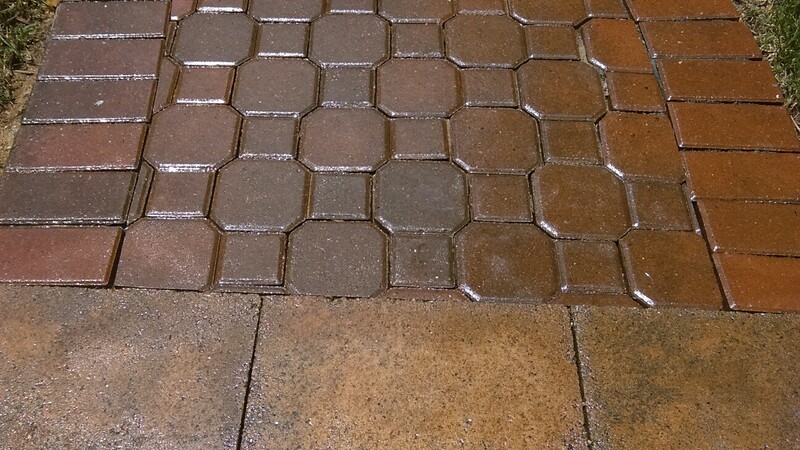 We’ll utilize our proprietary cleaning solution that will agitate the discoloring agents embedded in your hardscape and then scrub the area to further agitate these elements. Dirt, grime, and mold don’t stand a chance when it comes to Renew Crew of Charlotte. To find out just how effective we are, call us today at 704-445-3210! What stands out most to you when you’re looking at your hardscape patio or porch? If it’s green or black mold, dirt, grime or leaf stains, then it’s time to call the experts at Renew Crew of Charlotte. We’ll take the time to walk you through what’s causing your hardscapes to appear the way they do. Then we’ll show you precisely how we can remove all the discoloring agents and put a protective solution to properly seal your hardscapes. This is a very intense process that ensures your hardscapes look great and remain looking great for years to come. Most people associate intense pressure when they hear “pressure washing”. It’s a common misnomer in the pressure washing world. You don’t need to use high pressure for every job. In fact, using intense, high-pressure water may actually further damage your home’s hardscapes. Removing grout and the finish on your hardscapes is hardly what you want to happen. 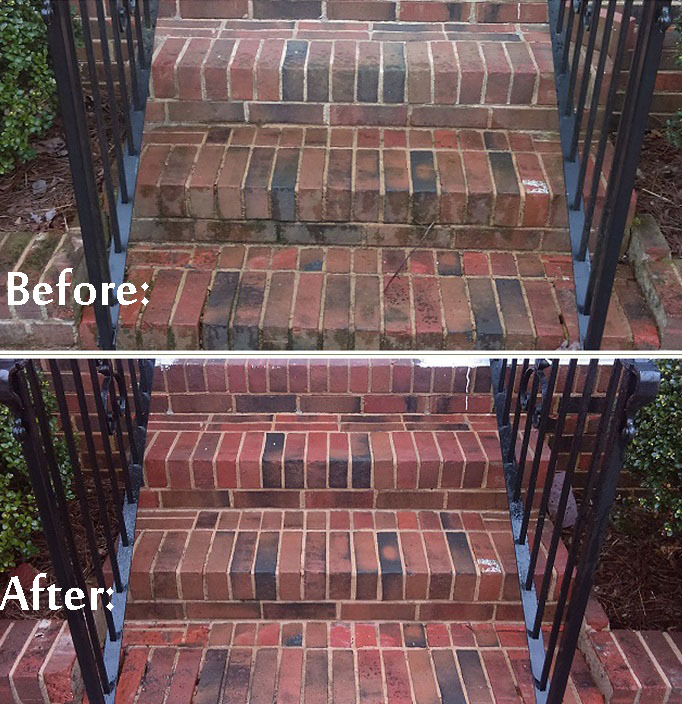 At Renew Crew of Charlotte, we’ll take our time to make sure that we’re thoroughly removing these discoloring agents and revitalizing your porch or patio to the point it looks nearly brand new. After applying our protective sealant, you won’t have to worry about foot traffic, UV rays, water and dirt affecting its appearance anymore. To find out why Renew Crew of Charlotte is the most trusted hardscape cleaning and sealing company in Charlotte, NC, and surrounding areas, simply give us a call at 704-445-3210 or email us at [email protected]. We look forward to hearing from you soon! Our Renew Crew Clean Proves White is OK After Labor Day! Fall is officially here, though it may still feel like summer, and Labor Day has come and gone! You may remember hearing your Mom, or Grandmother say “it’s bad taste to wear white after Labor Day.” This may be the case when it comes to fashion but when it comes to your home’s siding and trim, or you driveways or sidewalks, white is always in style! If your home’s siding, trim and architectural elements are meant to be white but are now dingy, dirty and discolored by the elements and time we can make them clean and bright again! The same goes for your concrete driveway and sidewalk(s) that may be stained or discolored from neglect. No matter what specific color your home’s siding and exterior features are meant to be, Renew Crew of Charlotte can keep them the color they are meant to be. Free of mold, mildew, stains, algae, dirt and debris. We can clean and renew the look of all your exterior outdoor surfaces and maintain that clean on a regular basis. Ordinary pressure washing can leave mold, mildew and embedded dirt untouched. That’s why Renew Crew of Charlotte employs exclusive solvents that penetrate deep, loosening grime from pores that typical power washing or pressure cleaning can miss. Commercial pressure washing services simply can’t provide the superior siding cleaning, concrete cleaning, deck sealing, etc. you’ll enjoy with Renew Crew. A simple pressure washing company does not have access to Renew Crew’s proprietary cleaning compounds and sealing polymers. These were developed and refined exclusively for Renew Crew of Charlotte. Neither you nor any pressure washing company can purchase these exclusive formulas in any store. With the passage of Labor Day and fall days ahead, you can welcome all your anticipated outdoor events with a beautifully renewed home façade, entryway, deck, patio, shed, pool deck, porch and more! We can tackle any surface on your property and brighten it. You won’t have to lift a finger while we take care of it! Contact us today at 704-445-3210 to learn how to keep your home and outdoor surfaces clean, protected and bright — make Renew Crew of Charlotte your new standard of clean! Does your deck look a little worse for wear? Is it looking old, dingy and moldy? If so, don’t move hastily toward tearing it down and installing a brand new deck. Call the local experts at Renew Crew of Charlotte to find out what we can do to make your deck look better than the day it was first installed. While you think this sounds impossible, we’re Charlotte’s deck cleaning and staining specialists. Additionally, we’ve teamed up with Archadeck of Charlotte, so we can even offer deck repair and replacement options if needed. For all your deck cleaning and staining needs in the Ballantyne area, call Renew Crew of Charlotte today at 704-445-3210! Dull, grey decks are unsightly and often an eyesore. With a Renew Crew clean, your old, dingy deck will look so phenomenally good that you and your neighbors would swear that it’s brand new. That’s precisely what we can offer our customers – the chance to fully revitalize your deck’s appearance without the thousands of dollars in full-on deck replacement. In addition to making your deck look phenomenal again, we’ll also ensure that your deck is protected from the elements through the use of our proprietary sealant/protectorant. No matter how bad your Ballantyne deck looks, we can most likely clean and stain it to the point that it looks completely new again. So, if you’re looking for deck repair or deck restoration in the Ballantyne area of Charlotte, call Renew Crew today at 704-445-3210 or email us at [email protected]. We look forward to hearing from you soon! Revitalize Your Charlotte Fence with Renew Crew! If your wooden fence looks like it was built at the turn of the 20th century, then it’s time to call the professional fence cleaning and staining company in Charlotte, NC. At Renew Crew of Charlotte, we specialize in cleaning and staining nearly all wooden surfaces. Your fence is no different. If the years of weather, dirt and grime are causing your fence to look older than it is, simply call us for a free estimate. We’ll let you know what to expect and how “far gone” your fence truly is. Call us today at 704-445-3210! We’ve been cleaning, staining and restoring decks and fences in the Greater Charlotte Metro for nearly a decade and a half. Before you begin the expensive undertaking of installing a brand new fence, just call Renew Crew. We’ll let you know exactly what your fence’s current status is and precisely what we can do to revitalize its appearance. Our 3-step cleaning process will bring your wooden fence back to life! We don’t use harsh, intense pressure washing to clean your wooden surfaces. Using too high of a pressure will usually damage your wooden surfaces. We will apply our foaming agent to your fence that will agitate the discoloring agents in the wood and cause them to rise to the surface. Then, we’ll gently rinse the accumulated dirt, grime, and other discoloring agents off and your wooden fence will look new again already. However, we don’t stop there. We’ll also apply a protective sealant that not only keeps your fence looking great for years to come, by shielding it from UV rays, water and dirt, but the sealant will also act as a beautiful stain. We have several colors to choose from, so we can really make your fence look new again! To find out why Renew Crew of Charlotte is the most trusted fence cleaning and staining company in Charlotte, NC, call us today at 704-445-3210 or email us at [email protected]. We look forward to hearing from you soon! Let Renew Crew of Charlotte help revilatize your NoDa, South End or Plaza-Midwood outdoor surfaces! The team at Renew Crew of Charlotte loves what we are witnessing around the Queen City as many vintage areas are being revitalized! Homeowners are buying into the North Davidson (NoDA), South End, Elizabeth and Plaza-Midwood areas in and around uptown and turning them into hot neighborhoods that are in demand. The surge in popularity within these established communities is making what’s old new again and one of the fastest growing demographics in the area. 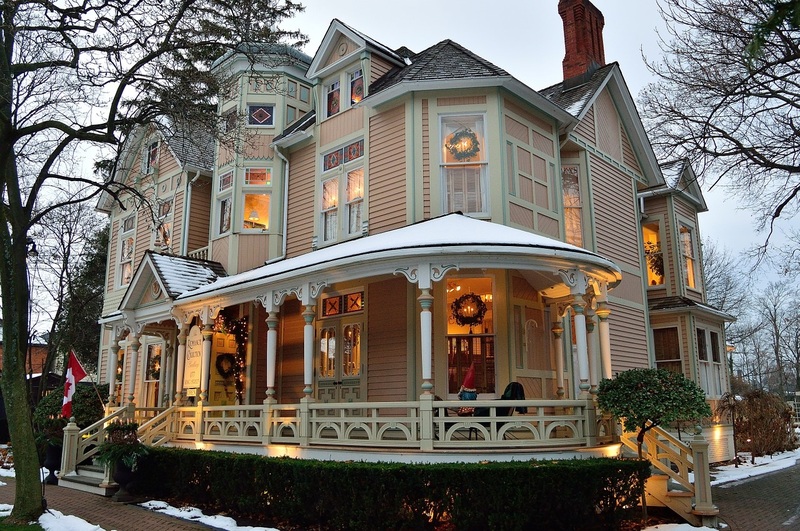 Many homeowners are buying these wonderful older homes looking to restore them to their former grandeur, and we have been thrilled to be part of the restorations and improvements in these areas. We have been busy cleaning, staining and sealing many decks, porches, fences and patios—and also breathing new life into homes with old siding, brick, stone and stucco facades. Renew Crew of Charlotte can help be part of the restoration of your vintage home by removing years of grime and mold off virtually any outdoor space on your property. We take care of siding, driveways, sidewalks, walkways, garages, sheds, and more! While you remodel the interior of your home to show off its vintage beauty, let Renew Crew of Charlotte help you tackle the outside. Your friends, family and neighbors will be amazed at how we can get things looking nearly brand new with our Renew Crew clean process. We can get all your home’s exterior surfaces shiny clean without a mega sized investment. Getting rid of decades of grunge, algae and mold that can make your house look bad and lower its curb appeal and even its value! Protect your investment with our patented eco-friendly, safe cleaning and sealing process that inflicts zero damage to your structures or landscape. This much-needed maintenance saves your home and property from going into ruin due to neglect, and ensures your outdoor surfaces last as long as possible without need for a costly replacement thanks to proper care. Our cleaning solutions are earth-friendly and do not use noxious bleach-based chemicals that can cause harm. Our gentle foaming cleansers are specially formulated to lift dirt without the need for a high pressure washer that is extremely damaging. Disregarding your home’s siding, deck, fencing, patio, pool deck or shed will lead to rot and other damage that can lead to an expensive replacement due to inattention. 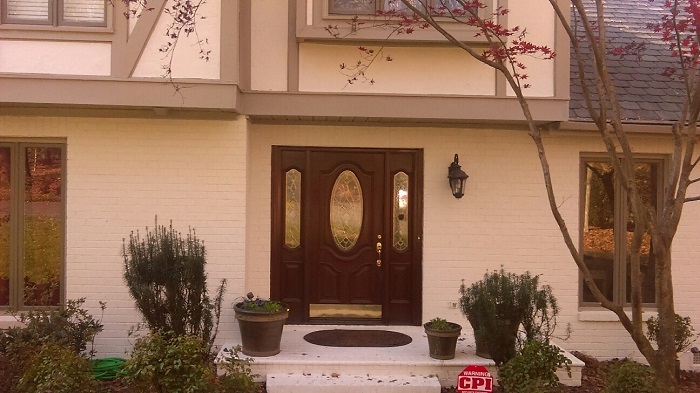 Renew Crew of Charlotte will get your home clean, provide a new coat of stain and then seal everything to protect it and refresh the whole look of your exterior. 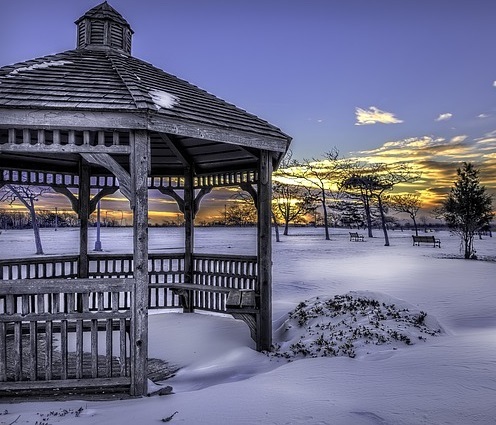 You can ensure your home and structures will be guarded against detrimental sun, rain, ice and snow for years and bring your pride of ownership. We Clean Nearly All Outdoor Surfaces at Renew Crew of Charlotte! We realize when our customers contact us they initially think we just clean decks—and we can sense the excitement the moment they hear we do much more than that. We are able to offer a whole house clean package that literally gets every outdoor surface you have sparkling clean! There’s virtually no outdoor surface that can’t benefit from our services including your driveway, sidewalks, deck, home siding (even stucco), fence, shed, pool deck, patio and even your roof shingles! If you are dealing with stained, dirty or moldy outdoor surfaces that have seen better days, this is the kind of challenge that Renew Crew of Charlotte loves to take on. No, we don’t use high powered washers that blast away and can damage surfaces and weaken them. We have expressly developed gentle foaming cleaners that deeply penetrate grimy stains and lift them off thanks to our special formulation. These cleansers do the hard work, so we don’t have to use any excessively high powered water to remove dirt. Everything is safe to your surfaces and safe for your pets, family, and landscape. Don’t waste your time hiring a no-name guy with a power washer that shoves a flier into your mailbox. We are licensed, insured and bonded, and our technicians have been professionally trained to clean every aspect of a home and your property. We don’t use caustic bleach products that smell awful, damage wood and are bad for the environment and will kill your landscape plants. Everything we use is non-toxic and mild, yet it gets the job done. When we are done, you will absolutely agree that everything looks almost as good as new. We also won’t damage your wood, brick, stone or stucco and then disappear when you are unhappy with the damage they’ve wreaked due to lack of experience or proper cleansers. We guarantee everything we do and we protect your investment fully. We will inspect everything to ensure that it’s all structurally sound prior to cleaning. After we get every gleaming, we will then stain and seal it so you can years of extended use without having to replace it. Good maintenance safeguards your home and outdoor structures to last for years and look great, too! Don’t waste your time with an inferior service that uses harsh chemicals and extreme water pressure as this is the WRONG way to do it right. There’s virtually no outdoor surface that we can’t take care of for you, and if it’s grubby and slimy, you can bet we can get if clean and looking refreshed. If you want a dazzling fresh look that is harmless to your kids, pets and plants then you can have it all. We go BEYOND the deck and can tackle any outdoor surface you can toss at us—even delicate stucco and metal siding, too! Our rates are competitive and we guarantee your satisfaction. Call us now before summer parties get underway! Let’s impress your guests with a whole house clean! Let Renew Crew of Charlotte take the responsibility of maintaining your wood deck, house siding and other outdoor structures! Give us a call for a free consultation at 704-445-3210 or send us an email at [email protected]. When you’re looking for a company to clean and maintain your exterior surfaces, it may appear as though your options are endless. However, it’s of the utmost importance that you perform your due diligence before hiring just anyone. When it comes to cleaning your Charlotte, NC, home’s exterior surface, your best course of action is to trust the pros at Renew Crew of Charlotte. If your home’s exterior surfaces are in need of cleaning and maintenance, don’t hire a “jack of all trades” or fly-by-night company to do it for you. Renew Crew of Charlotte is different. Exterior surface cleaning, renewal, and maintenance are ALL we do. We take pride in our ability to deliver you a Renew Crew Clean and the training, knowledge and expertise to stand behind our services. Our team is trained, at length, on every tiny detail involved in correct and safe pressure washing protocol, cleaning, staining, sealing and maintaining your home’s siding, hardscapes, concrete surfaces and outdoor living spaces. We make sure each member of our team masters power washing, how to properly utilize our exclusive products and the process involved in each crucial step before they begin work on their first project. In short, by hiring the wrong company to pressure wash your home’s exterior surfaces, you may end up costing yourself hundreds, if not thousands, of dollars unnecessarily. So, make certain you do your homework on the company you’re hiring and then do more research. Your home is, after all, more than likely your largest investment, so why wouldn’t you make certain you’re hiring the best company to clean its exterior? To find out why Renew Crew of Charlotte is the most trusted power washing, staining, and maintenance company in the Charlotte, NC, market, call us today at 704-445-3210, email us at [email protected] or visit our website for even more information. We look forward to hearing from you soon! Avoid Toxic and Dangerous Bleach when Cleaning a Deck! It can Cause Damage to Your Health, your Landscape and the Life of the Structure! Many deck cleaning companies which aren’t environmentally proactive will use bleach as a liquid solvent for cleaning your deck because it’s cheap and readily available without much fuss on their part. Just because it’s easy for them, doesn’t make it good for you, your deck or your landscape plants. Bleach should never be used on wood or composite decking as a surface cleaner as it is highly damaging and toxic. 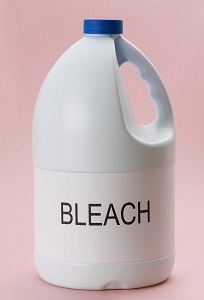 Bleach is extremely noxious to inhale and contact can cause you and your pet’s respiratory issues, skin burns, painful headaches, harm to your nervous system and nausea. It’s downright dangerous! Lumber and composite decking companies will caution you that bleach will fade and weaken wood and composites and will lead to splinters, chips, and cracks. Chlorine bleach is highly acidic and will corrode metal, so you are jeopardizing the bolts, screws, nails and hanging hardware that keep your deck together. If bleach is used continually to clean a deck over time, it can inevitably lead to an early breakdown of the deck to the point that it will have to be replaced. With an investment that large, the goal is to keep it sound for as long as you can so that it survives beyond its statistical life with proper care and maintenance. If you use the proper and safe cleaners, stains and sealers such as the ones we use at Renew Crew of Charlotte, then you can have a long-lasting deck without question. Don’t let these cleaning companies tell you that bleach kills mold either. That is simply not true over time. In fact, bleach often encourages mold to return even worse than before. Since bleach vaporizes very quickly on surfaces (particularly when exposed to sun), it never has enough time to kill most mold’s interior living core—and that’s why many people notice that the mold will often return and be even more hostile than before and of an even darker color. Delicate landscape plants that you’ve spent lots of money on and time caring for will absolutely be damaged by chlorine bleach too. Their delicate roots and leaf structure cannot withstand the harsh chemicals and it will kill the plant or shrub without question. Why risk your landscaping, the longevity of your deck structure and the health of your family and pets? And that doesn’t even include the damage that an inexperienced cleaning crew can wield with a power washer on the wrong setting that can pit and mar your deck and cause irreparable damage and ultimately the replacement of expensive decking boards. Anyone can stuff a flier in your mailbox and claim to clean your deck on the cheap who doesn’t know what they are doing simply because they own a power washer. Don’t fall prey to unscrupulous and alleged “deck and siding cleaning companies” that have no real background in the industry, and if damage is done will simply disappear and not stand behind a repair. Let Renew Crew of Charlotte do it right and clean your deck safely and help you maintain it so that it lasts. And you can be assured that our pricing is in line with any of our competition, too and we back everything we do. Our environmentally friendly method of eliminating years of dirt, mold, and mildew with our special unique foaming cleaning solution gently removes years of ugly filth without damaging the wood or composite. We don’t use any dangerous or foul-smelling products such as chlorine, and we also complete the job with our patented sealer that then protects your deck harmful UV rays and repels mold and mildew build up. Your old wood will have a fresh look that is pretty close to brand new! To safely clean and protect your deck without the use of hazardous and harsh toxic chemicals, give Renew Crew of Charlotte a call today to learn more about our keeping your outdoor surfaces looking great year after year! Give us a call for a free consultation at 704-445-3212 or send us an email at [email protected]com. Renew Crew of Charlotte Will Protect Your Deck, After We've Brought it Back to Life! If you’re looking for your deck to be completely revitalized, then you’ve come to the right place! At Renew Crew of Charlotte, we believe that your home’s deck can and should last longer. That’s why we offer deck cleaning and staining services that will make your deck really “pop” with a new appearance, and we’ll apply a protectant coating to ensure its longevity. 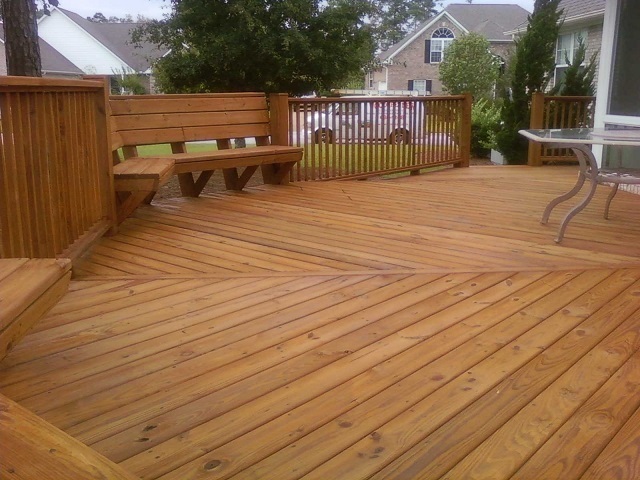 So, before you go shopping for a brand new deck, give the experts at Renew Crew of Charlotte a call. We’ll arrive at your property and inspect your deck’s condition to determine the degree of work that’s required to fully renew it. You would be quite surprised at some of the decks that appeared to be long gone, but Renew Crew of Charlotte brought them back to life. Call today for an estimate at 704-445-3210! If your deck appears to be nearing its end, call Renew Crew of Charlotte first! Renew Crew of Charlotte has perfected an eco-friendly, quality deck cleaning experience through our proprietary 3-step cleaning and sealing process to combat time, grime and the elements. First, we begin with a pre-soak foam that loosens the dirt and grime that has accumulated on the surface. 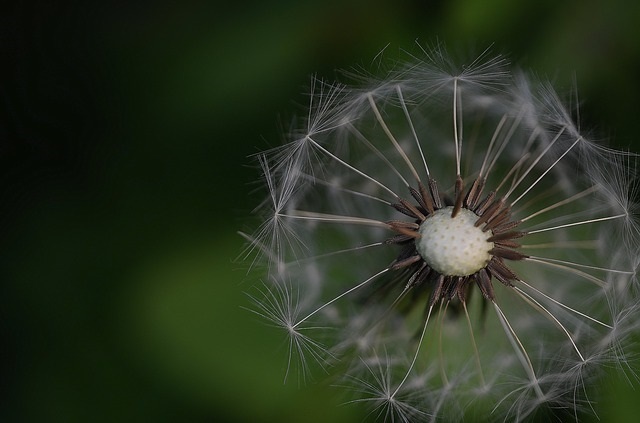 Unlike other deck cleaning and staining companies in Charlotte, NC, our cleaning solution is environmentally friendly and won’t damage your plants, grass, animals or your home. After we’ve applied the pre-soak foam, we’ll then rinse off your deck using a lower-pressure cleaning. The third step is most crucial. After we’ve completely cleaned your deck, we’ll then apply a protectant to prevent UV damage, dirt buildup and the elements overall. So, before you give up on your deck completely, make sure to call the most trusted deck cleaning and staining company in Charlotte! You can get in touch with Renew Crew of Charlotte by calling us at 704-445-3210 or by emailing us at [email protected]. We look forward to hearing from you soon! How often should my Charlotte wooden deck be stained? Out of all the inquiries we receive at Renew Crew of Charlotte in regards to our exterior cleaning and sealing services, the question of “how often should my Charlotte wooden deck be stained”, is the most frequently asked. To answer this question, there are many factors that come into play. #1 has your wooden deck been maintained properly since installation? #2 what is the proximity and placement of your deck in regards to the sun, or is your deck located in a more northerly exposure? 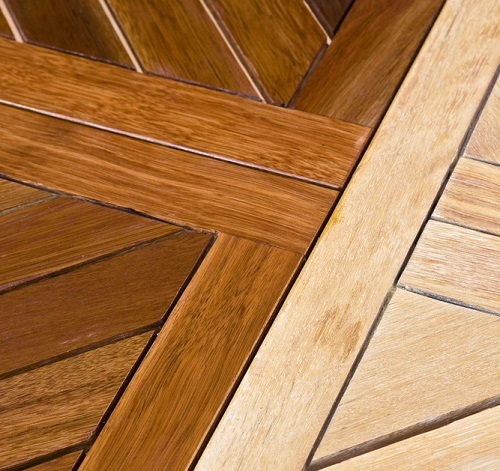 What type (or species) of wood is your deck built from — Pressure treated pine or a hardwood such as Ipe? 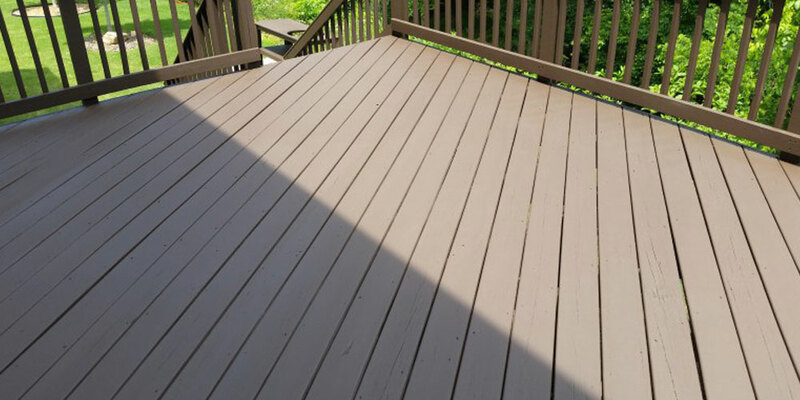 Answering these questions helps determine the frequency your deck needs to be stained in order to keep it looking, and performing, its best. Keep in mind that the location of your deck in proximity with the sun, or shade, can determine how your deck’s surface will respond to outside influences such as fading from sun exposure, or mold and mildew accumulation from a northern orientation. There are dozens of factors involved when determining the frequency to stain your outdoor deck, each of which can influence the stain’s longevity. Keep in mind your outdoor living space is exposed directly to the elements such as UV rays during summer and during winter is exposed to extremely cold temperatures. When all these factors come into play, your particular deck may require restaining each year, or maybe every other year. Here at Renew Crew of Charlotte we have the solution for homeowners that may have a deck that requires more or less attention — our Renew Crew Maintenance program! This program takes the “guess-work” out of knowing when is the right time to maintain your outdoor space in order to keep it looking, and functioning, at optimal performance. Once we have cleaned and sealed your deck we can sign you up to participate in our maintenance program. This means every three months following completion of the initial service, one of our experts will inspect your deck to make sure the stain is doing its job, to see if a cleaning or any touch ups are needed. If this is the case, we will schedule accordingly. By paying close attention to your deck, and using this approach, we can keep your deck looking beautiful much longer and save you money over the life of your deck. We care about our customers and strive to enhance their outdoor living experience by taking care of maintenance of your space, so you don’t have to worry about it! If your existing deck is in need of a makeover or if you are interested in keeping your new deck or wooden outdoor structure looking new, give us a call for a free consultation at 704-445-3210 or send us an email at to learn more about all the exterior the surfaces we clean and renew through our proven cleaning and restoring process. When considering cleaning and staining your Charlotte-area deck, make sure you perform your due diligence before hiring just anyone. At Renew Crew of Charlotte, we offer numerous solutions to cleaning your home’s deck, patio, pavers or other hardscapes and are fully insured. We utilize a proprietary cleaning solution that will remove discoloring agents from your deck’s surface and then we gently scrub those away. Most companies utilize high-pressure cleaning machines, which can actually do more harm to your deck than if you never had it cleaned in the first place. When searching for a reliable cleaning and staining company for your home’s deck, make sure to rely on the trained and experienced professionals at Renew Crew of Charlotte. For all your deck cleaning and staining needs in Charlotte, NC, call Renew Crew of Charlotte today at 704-445-3210 or email us at [email protected]. We look forward to hearing from you soon! Eco-Responsible Deck Cleaning in Charlotte! Who cleans your exterior surfaces? Do you have a company you use for scheduled deck and exterior cleaning? Do you clean your surfaces yourself? No matter what your answer is, chances are one of the main ingredients being used in the process is bleach. The debate about using bleach as a deck cleaner has been ongoing for decades. The truth is, unscrupulous and uneducated cleaning companies will incorrectly use bleach to clean your deck and other outdoor surfaces. This is because bleach is abundant and cheap, which is dangerous not only for the environment but for you and your family! Bleach is highly poisonous to breathe in and it breaks down decking made of natural wood and composite to the point that it will need to be replaced because it deteriorates the structure’s integrity. In fact, many composite decking manufacturers will void your warranty if bleach is used as a cleaner. It’s so damaging and harmful that it can cause innumerable health problems such as vomiting, injury to your lungs, burns, and excruciating headaches. And it doesn’t only affect humans—it also affects your pets and plant materials within your landscape, too. Bleach damages your landscape and turf grasses. Chlorine bleach is so destructive that it causes chipping, cracking and splintering of both natural and composite deck boards. It is highly corrosive, putting the structural components of your deck at risk. 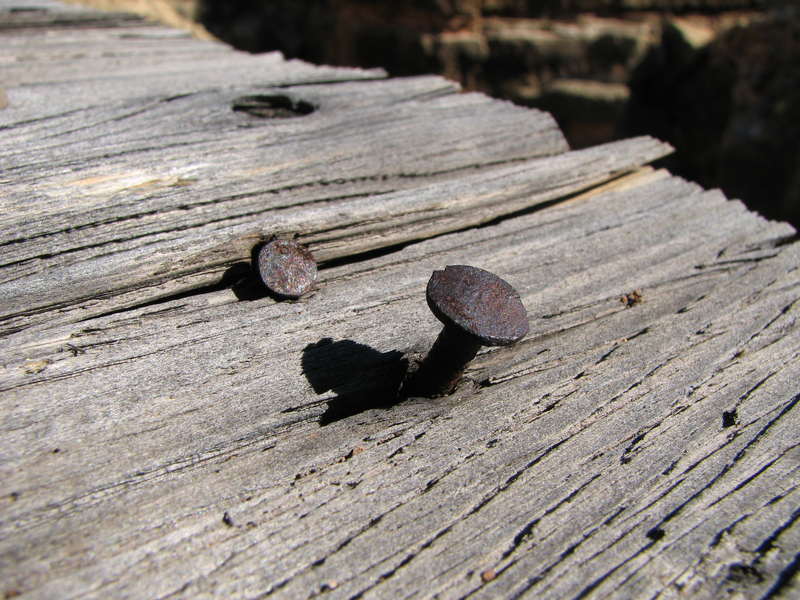 Vital elements used in the construction of your deck, such as screws, nails, bolts and hangers will be damaged and pitted over time as bleach wreak its havoc on the support of your deck. Instead of having a structure that can last several decades, you will be replacing it sooner rather than later thanks to the acidic nature of this harsh chemical. The products we use at Renew Crew of Charlotte aren’t noxious or hazardous.Our exclusive biodegradable and environmentally-friendly foam clings and penetrates, loosening deep-down dirt and gray wood fibers. The foam lifts the loosened dirt, bringing it to the surface, while also killing mold and mildew without harsh chlorines. Not only do we clean your deck in an environmentally-friendly way, but we can also stain and properly seal it afterward so it is protected from detrimental ultraviolet rays and resistant to mold and mildew. An old deck—whether wood or composite—will look almost as if it’s brand spanking new. We can clean all your outdoor surfaces including masonry, stone concrete and even your home’s siding! The myth of using bleach as a deck cleanser has been ongoing for decades, and it can’t be more wrong! Unscrupulous and uneducated cleaning companies will incorrectly utilize bleach to clean a deck and other outdoor surfaces and this is very damaging and as environmentally unfriendly as it can get. Less knowledgable cleaning crews use bleach by the bucketful to supposedly clean your deck because it’s low-cost to them, but it’s extremely harmful to your surfaces, your landscaping and most of all — your family. Bleach is highly poisonous to breathe in and it breaks down decking made of natural wood and composite to the point that it will need to be replaced because it deteriorates the makeup of the structure’s integrity. In fact, many composite board manufacturers will void your warranty if bleach is used as a cleaner. It’s so damaging and harmful that it can cause innumerable health problems such as vomiting, injury to your lungs, burns, and excruciating headaches. And it doesn’t only affect humans—it also affects our pets too. Chlorine bleach is so destructive that it causes chipping, cracking and splintering of both natural and composite deck boards. It is highly corrosive, putting the structural components of your deck at risk as well. Anything such as screws, nails, bolts and hangers will be damaged and pitted over time as bleach wreak its havoc on the support of your deck. Instead of having a structure that can last several decades, you will be replacing it sooner rather than later thanks to the acidic nature of this harsh chemical. Why would you throw away a big investment in a deck only to have a cleaning crew destroy it because bleach is cheap and easily accessible at any big box store? 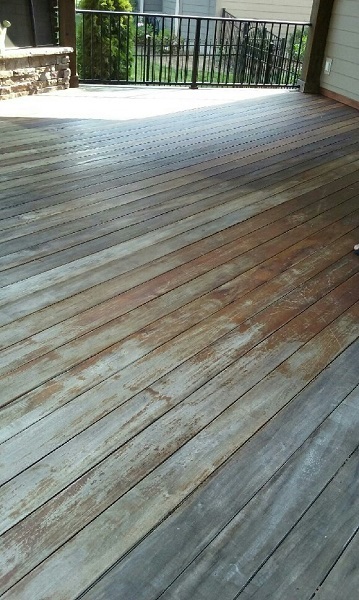 Not only is the fact that many exterior surface cleaning companies use bleach, but they also typically use a high PSI power washer to attempt to scour your deck clean, and there is nothing worse than an unqualified crew damaging your decking boards because they are using unnecessarily high levels of water pressure to wash your deck. You are risking pitting and rupturing your deck boards with excessive and unnecessary water force and the only way to fix that is simply through replacement. Choose Renew Crew of Charlotte to preserve your deck for years of enjoyment and to properly care and clean your deck with environmentally-friendly foaming cleaners that are harmless to you, your pets, your shrubbery and the deck itself. With regular maintenance, we can assure you that your deck will last and provide your family with plenty of enjoyment for years to come. We only use our proprietary cleansers, stains and sealers that will prolong the life of your deck and your enjoyment of it without the hassle. We can get rid of mold and mildew the safe way with cleansers that are safe, and you don’t have to worry about damage to your landscaping. Our friendly foaming cleanser is what does the trick as it gently lifts off years of dirt, grime, grease, mold and mildew in a gently. In addition, our products aren’t stinky, noxious or hazardous. Not only do we clean your deck, but we can also stain and properly seal it afterwards so it is protected from detrimental ultraviolet rays and resistent to mold and mildew. An old deck—whether wood or composite—will look almost as if it’s brand spanking new. We also clean all you outdoor surfaces including masonry, stone concrete and even your home’s siding! Don’t succumb to a “fly-by-nighter” with a power washer who leaves a flier on your mailbox! Outdoor surface cleaning and renewal is all we do, all the time. Protect your outdoor structures by calling Renew Crew of Charlotte to keep your outdoor surfaces looking great year after year! Give us a call for a free consultation at 704-445-3210 or email us at [email protected] today! At Renew Crew of Charlotte, we know how to protect a deck. Still, decks aren’t our only area of expertise. We know how to protect a deck, paver patio, flagstone patio, travertine patio and more! Our proprietary sealing technology will ensure your home’s outdoor living spaces don’t fall victim to the elements. Revitalizing your deck requires more than a little scrubbing. Dirt and mold hide deep within the wood, requiring a strategic plan of attack to remove. That’s where out signature 3-step-process, perfected through 20 years of working alongside chemists, comes into play. Our formulas draw out embedded dirt, kills mold and mildew, and provide the longest lasting seal against the elements. We know how to protect a deck, ensuring it is always ready for both everyday use and your special outdoor moments. Queen City homeowners spend thousands each year on gorgeous hardscapes, paver patios, stone walls, stone fireplaces, paver driveways and other beautiful stone works. When newly installed, these impressive creations can completely transform dull landscapes into the talk of the neighborhood. Time and exposure to the elements wears on them, however, leaving once pristine designs looking worn. Fortunately, Renew Crew can protect these elements just as effectively as we can protect a deck! 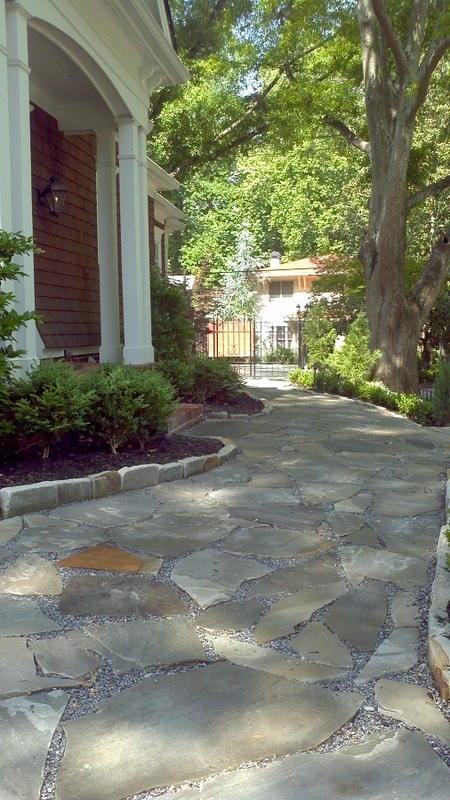 Our superior, proprietary sealing solution will make your hardscapes look good as new. Let Renew Crew of Charlotte Get to Work for You Today! To find out how Renew Crew of Charlotte can protect your deck, call us today at 704-445-3210, email us at [email protected] or visit our website for even more information. We look forward to hearing from you soon! 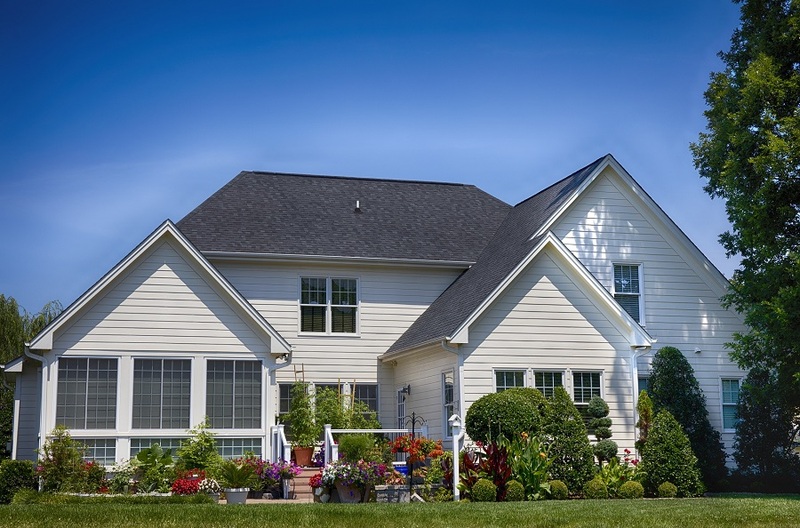 Cleaning your home and staying on top of exterior maintenance can increase your home's value! As we begin a new year, many Charlotte area homeowners are making plans to not only enhance the curb appeal and beauty of their homes but also get their homes ready to place on the market in the early spring. Late February through March is known to be the best time of year to list your home. Whether you are looking to upgrade to a larger home, downsize or move into a different area, making your home more appealing to more buyers is important. Before you begin to schedule costly upgrades to your home it is always a good idea to improve the appearance and “sale-ability” of the investment you already have by having the inside and outside of your home clean and looking its best. According to a recent article featured in HGTV that outlines the top 30 tips on increasing your home’s value, cleaning and maintenance are some of the least expensive and easiest things a homeowner can do to boost curb appeal! The old adage that you only get one shot at a first impression is true. So, make your home shine from the moment someone pulls into the driveway and walks through the door. Hiring a cleaning service to clean the exterior and interior of your home will ensure a thorough top-to-bottom scrubbing. Even if you clean your home regularly, there are nooks and crannies that you may miss or overlook. Let a cleaning service do the dirty work to really make your home sparkle. The article suggests walking around your home and making a list of all the little things that are broken or in need of repair. This includes the exterior as well as the interior areas of your home. Individually, small repairs might not seem important, but if every area has just one thing wrong, those small things will add up to create the impression that your home has been neglected. This may include a front door bell that doesn’t work or even a backyard deck that is dirty and in need of staining. Staying on top of maintenance today also eliminates problems down the road should you decide to sell. There is no substitute for being a proactive homeowner and keeping up with maintenance on your home and outdoor structures — and the difference shows! These two areas are where Renew Crew of Charlotte can help. Our specialty is helping you maintain a clean and maintained home through our exterior cleaning and renewal services. We offer a wide menu of services from whole home exterior cleaning to deck cleaning and staining and much more a’ la carte. Our experienced exterior cleaning and sealing professional can evaluate the surfaces during a free walk-through consultation to help you determine the areas that need the most attention. 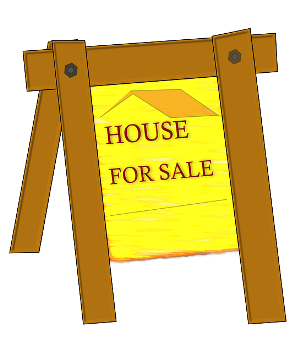 If you are thinking of selling your home in the near future — you can leave all the “dirty work” to us! 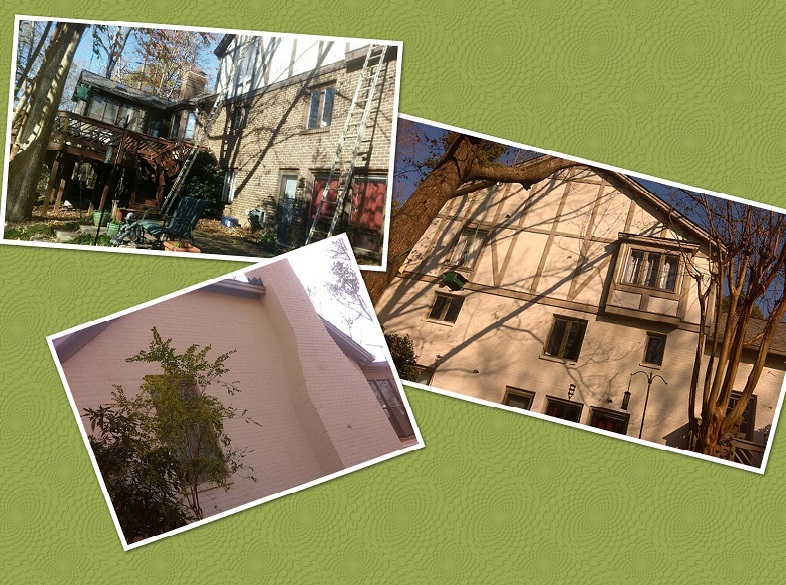 Renew Crew of Charlotte will tackle any exterior area you need revitalized with a thorough washing. We will take care of your house, patio, driveway, sidewalk, fence, pool deck, garage, shed and any other outdoor structure that needs to look its best. We only use our patented foaming cleansers that are environmentally-friendly and safe for your family, landscaping and pets. We do not use bleach or any damaging chemicals that are toxic, malodorous or can irritate your lungs. Our techs are trained to pay special attention to your home and outdoor structures thanks to our gentle cleansers that do not require high pressure washers to get the task done. When they are done removing years of grime, we can stain and seal your wood surfaces so they provide years of service and stay looking their best longer. Here is a list of the exterior cleaning and renewal services we offer. Don’t see your item of interest on the list? Call us — chances are we can take care of your specific concerns with our Renew Crew Clean too! Contact us today at 704-445-3210to learn how to keep your home sparkling clean! Every New Year begins with the determination and hope to make it a better year than the one before. This may involve personal, physical and financial goals you look to achieve in the coming year. 2018 is here, and that means a fresh start — a clean slate — a new beginning. A good catalyst to begin your journey is to ensure your everyday outdoor living spaces are conducive to your success. A great starting point is having your home exterior clean and renewed! Coming home to a clean home every evening creates an atmosphere of success. In much the same way looking your personal best inspires positivity, so does your environment. 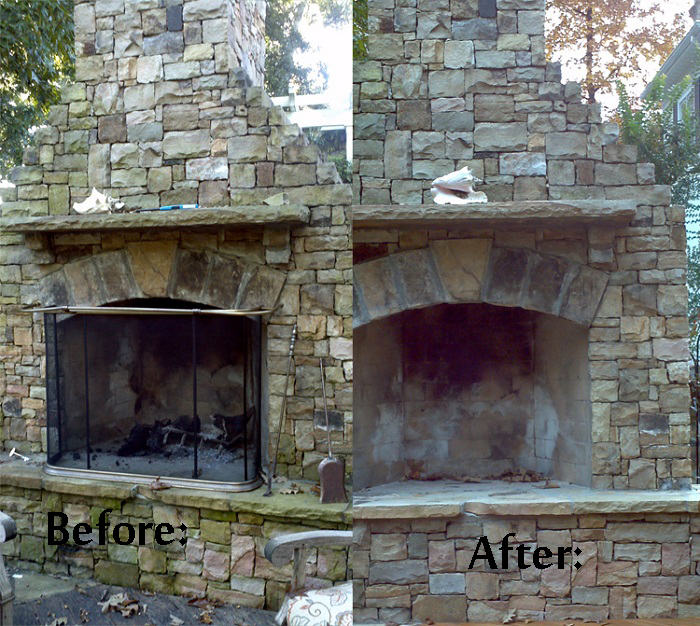 Renew Crew of Charlotte specializes in exterior cleaning and surface renewal. We can have your home and even your business, clean and bright from the entrance to the backyard surface for the New Year. Deck and wooden outdoor surface cleaning: Your deck and other outdoor living space surfaces deserve proper care and maintenance to protect them from exposure to the elements, changing seasons, time and everyday wear and tear. Proper deck care and maintenance involve protection & sealing. Renew Crew of Charlotte is the area’s first and only choice for professional exterior surface cleaning and protection. We can clean and protect your deck, making it ready to handle all of your special outdoor moments with family and friends and robust everyday use. Hardscapes and paver patio cleaning: Renew Crew of Charlotte provides concrete cleaning and sealing to not only make your hardscapes (travertine patio, paver patio) last longer but also look better. While some embedded stains may be too difficult to erase entirely, our exclusive cleaning solution and light pressure washing will wash away most dirt that has built up over time. After cleaning the hardscapes, we come back to seal it. The sealant, which is available in several finishes, will close open pores on the surface, stopping dirt, oil, water, etc. 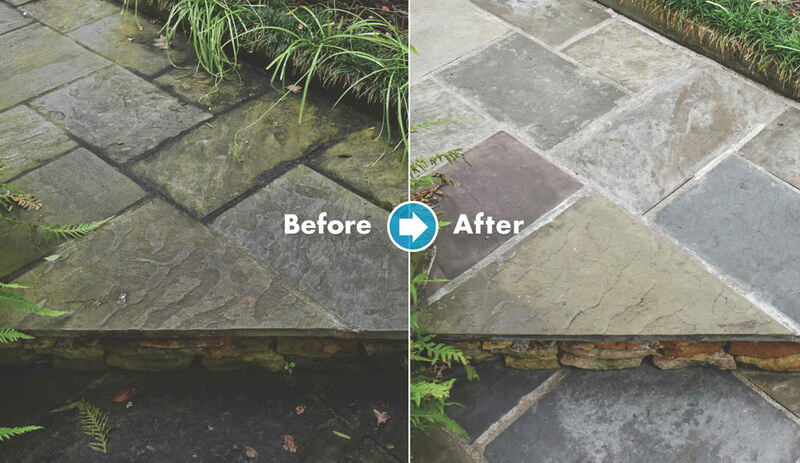 from penetrating the hardscapes — leaving your paver patio, flagstone patio or travertine patio surfaces Renew Crew Clean. We also clean brick and nearly all the hardscape surfaces around your home too! Siding cleaning: Our siding cleaning process begins with pre-soak foam which loosens the grime that has built up on the surfaces. Unlike outdoor cleaners other companies use, ours is environmentally friendly and won’t cause any damage to plants, animals or your home. This is followed by a non-damaging controlled pressure rinse. However, it is our third and final step, which truly sets us apart from the rest. We take cleaning and exterior surface rejuvenation one step further by protecting it to repel harmful outdoor elements, including UV rays. Start 2018 with a clean slate — Contact us today at 704-445-3210 to learn more and Happy New Year from Renew Crew of Charlotte! 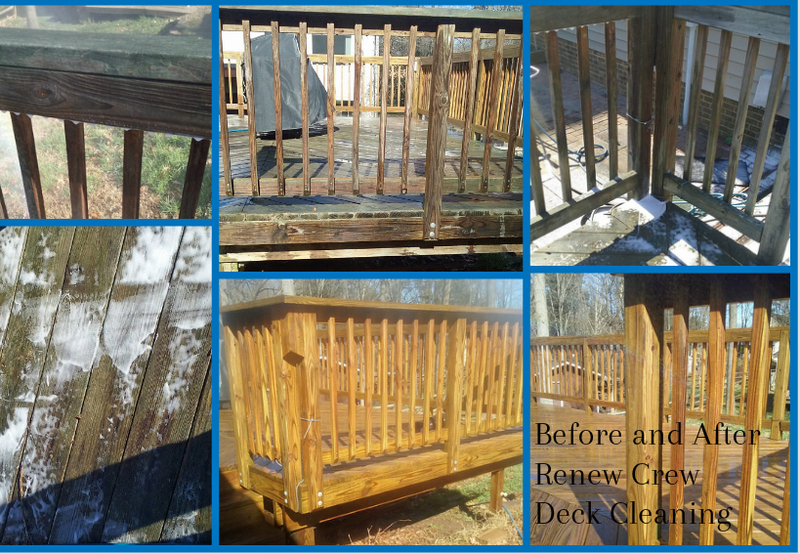 When It Comes to Deck Cleaning & Staining in Charlotte, NC, Call The Experts at Renew Crew! While you may feel the urge to get out your pressure washer and go to town on your deck, think twice before doing so. Do you know how much pressure you should utilize? 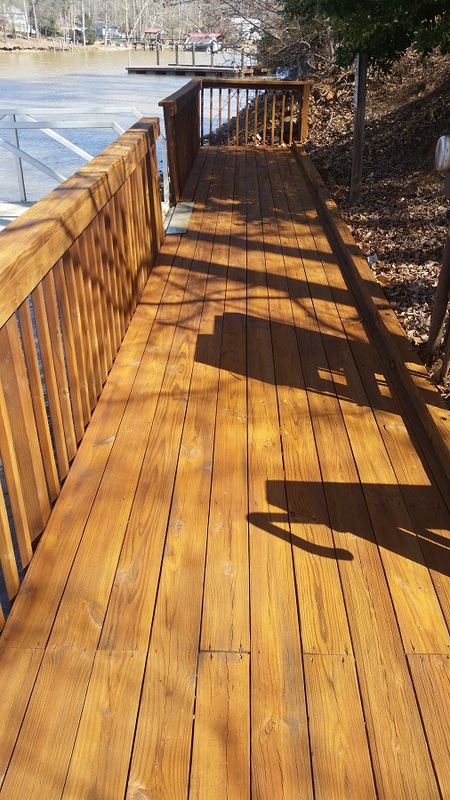 Do you know how to remove the discoloring agents from your deck without damaging the wood? If not, then consider calling the local experts at Renew Crew of Charlotte. If your deck is showing signs of years’ worth of discoloring and damage, call us today! Pressure washing can leave embedded dirt untouched. That’s why Renew Crew employs exclusive solvents that penetrate deep, loosening grime from pores that power washing or pressure cleaning can miss. Our eco-friendly solutions kill mold and mildew without harsh chlorine that can bleach your wood and kill your plants. And your surfaces look lovelier longer thanks to special polymers that seal and protect against grime and the elements. Commercial pressure washing services simply can’t provide the superior concrete cleaning, deck sealing, etc. you’ll enjoy with Renew Crew. A simple pressure washing company does not have access to Renew Crew’s proprietary cleaning compounds and sealing polymers. These were developed and refined exclusively for Renew Crew. Neither you nor any pressure washing company can purchase these exclusive formulas in any store. Why would you ever consider replacing your deck when you can Renew it? To find out why Renew Crew of Charlotte is the most trusted name in Charlotte, NC deck cleaning and staining, call us today at 704-445-3210 or email us at [email protected]. We look forward to hearing from you soon! As you’re more than likely aware, the holidays are upon us! Before you know it, it will be 2018 and everyone will return to work and life as normal. In the meantime, however, you’re more than likely going to be having guests over for holiday gatherings. Wouldn’t it be nice to really show your home in its best light? With a pressure washing, staining and sealing by Renew Crew of Charlotte, your outdoor surfaces can be made to look new again. If you’re wanting to impress the in-laws this holiday season, call Renew Crew of Charlotte to find out your options for deck cleaning and staining, patio sealing and home exterior cleaning. Pre-Soak Foam: Our exclusive biodegradable and environmentally-friendly foam clings and penetrates, loosening deep-down dirt and grey wood fibers. The foam lifts the loosened dirt, bringing it to the surface, while also killing mold and mildew without harsh chlorines. Power Clean: Non-damaging pressure rinses grime away and releases grey wood fibers. Surfaces are restored to their original appeal without gouging or blasting away good wood, and our power cleaning will not harm your plants. Protective Finish: Special polymers enhance and prolong the natural beauty of woods and extend the life of your surfaces. Our protective finish fights weather damage by repelling the elements, including UV rays. It also seals pores to fight dirt buildup. In addition to removing discoloring agents from your patio; whether it be flagstone patio, paver patio or even travertine patio, you can count on the local professionals at Renew Crew of Charlotte. The most important aspect of cleaning your hardscapes is ensuring that they’ve been properly sealed to ensure they stay looking great for years to come. In fact, after our patio cleaning and sealing, your pavers, travertine or flagstone will look nearly completely brand new. To find out how quickly Renew Crew of Charlotte can clean and seal your home’s outdoor surfaces in time for holiday guests’ arrivals, call us today at 704-445-3210 or email us at [email protected]. We look forward to hearing from you soon! Our environmentally friendly method of eliminating years of dirt, mold and mildew with our special unique foaming cleaning solution gently removes years of ugly filth without damaging the wood or composite. We don’t use any dangerous or foul-smelling products such as chlorine, and we also complete the job with our patented sealer that then protects your deck harmful UV rays and repels mold and mildew build up. Your old wood will have a fresh look that is pretty close to brand new! To safely clean and protect your deck without the use of hazardous and harsh toxic chemicals, give Renew Crew of Charlotte a call today to learn more about our keeping your outdoor surfaces looking great year after year! Give us a call for a free consultation at 704-445-3210 or send us an email at [email protected]. Renew Crew of Charlotte specializes in cleaning ALL types of outdoor surfaces, from siding and sidewalks to patios and decks — decks built from a variety of mediums including PT wood, composite and hardwood. Hardwoods are very popular among discriminating homeowners. Ipe (pronounced Ee-pay) is at the top of this list and is among one of the finest exotic hardwoods on the market today. Coveted for it’s striking pattern and rich color, Ipe is one of the many hardwood decking surfaces Renew Crew of Charlotte is proud to clean and maintain for homeowners all over Charlotte and the surrounding region. Renew Crew provides safe and effective deck sealing and cleaning. Our 3-step process ensures that your deck is effectively and safely cleaned and protected. Our foamer gently cleans without damaging your wood or other surfaces. We then seal and protect your deck to a like-new appearance. Sun exposure challenges your deck’s surface but Renew Crew of Charlotte cleans, seals, and protects your deck. Contact us today to schedule your deck cleaning and renewal today.Your wood deck needs regular care and attention. It’s a big investment so an investment in annual maintenance can dramatically increase the life span of your deck and your pride in ownership! 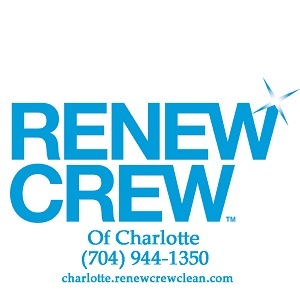 Contact us at 704-944-1350 or send us an email at charlotte.renewcrewclean.com. We Clean and Restore More than Just Decks at Renew Crew of Charlotte! 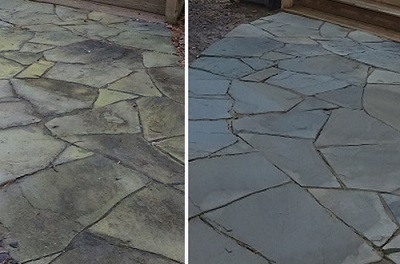 If you are dealing with stained, dirty or moldy outdoor surfaces that have seen better days, this is the kind of challenge that Renew Crew of Charlotte loves to take on. No, we don’t use high-powered washers that blast away and can damage surfaces and weaken them. We have expressly developed gentle foaming cleaners that deeply penetrate grimy stains and lift them off thanks to our special formulation. These cleansers do the hard work, so we don’t have to use any excessively high powered water to remove dirt. Everything is safe to your surfaces and safe for your pets, family and landscape. Let Renew Crew of Charlotte take the responsibility of maintaining your wood deck, house siding, and other outdoor structures! Give us a call for a free consultation at 704-445-3210or send us an email at [email protected]. We look forward to hearing from you soon! 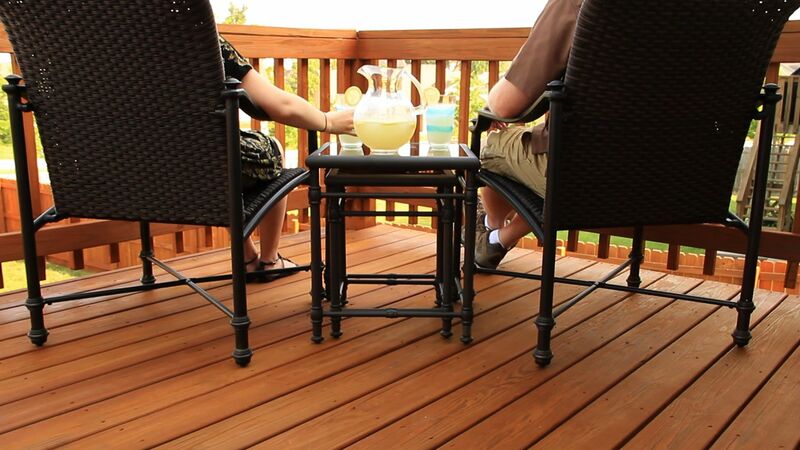 It's Time to Check Your Deck® as the Outdoor Living Season is Officially Underway! Deck Safety Month® is observed annually each May. With this in mind, as the month draws to a close, experts at the North American Deck and Railing Association (NADRA) recommend Charlotte-area homeowners Check Your Deck® before starting to plan family activities. Here at Renew Crew of Charlotte, we cannot stress the importance of checking your deck enough. For many, Memorial Day signifies the kickoff of the outdoor living season. This means you and your family will most likely be spending a lot more time outdoors, including your backyard deck and other outdoor structures. 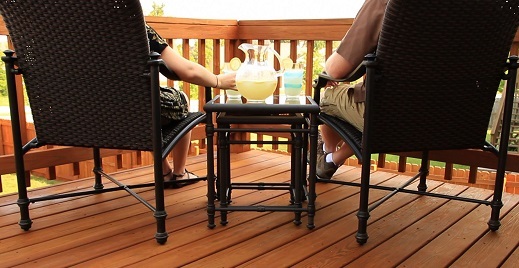 Your deck may serves as the perfect place to enjoy warm weather with friends and loved ones. However, a poorly maintained or unsafe deck could possibly collapse, causing serious injuries to you, your family and your guests. Renew Crew of Charlotte conducts an inspection when scheduling any new deck cleaning, or deck cleaning and sealing project. If we find issues with the structural integrity, we then inform the homeowner of the problem. 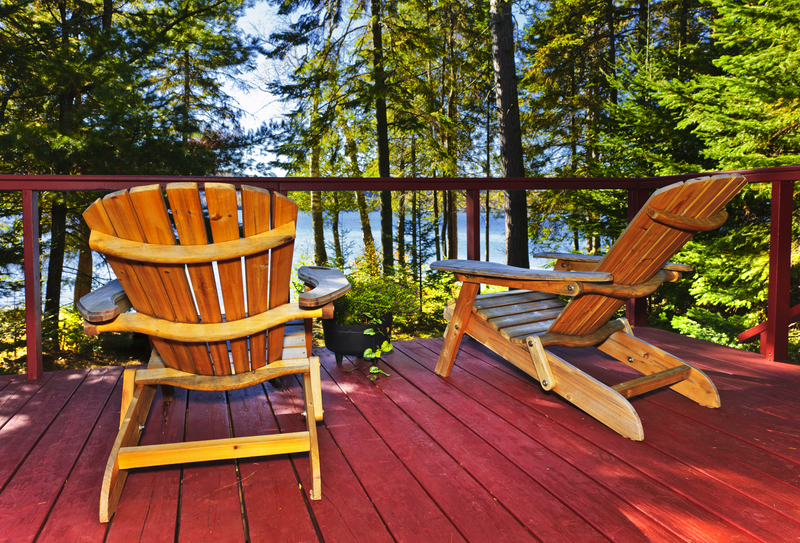 A well-built and well-maintained deck can provide years of enjoyment for you and your family. However, an improperly built or deteriorated structure can mean disaster. We specialize in keeping your outdoor structures looking and functioning, at their best. 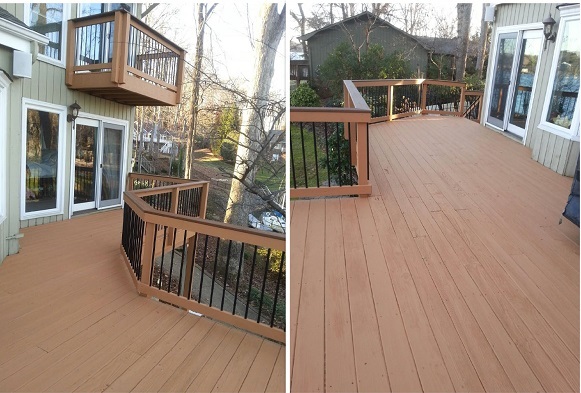 We seal and maintain new decks, and can protect and revive existing decks to their former splendor. 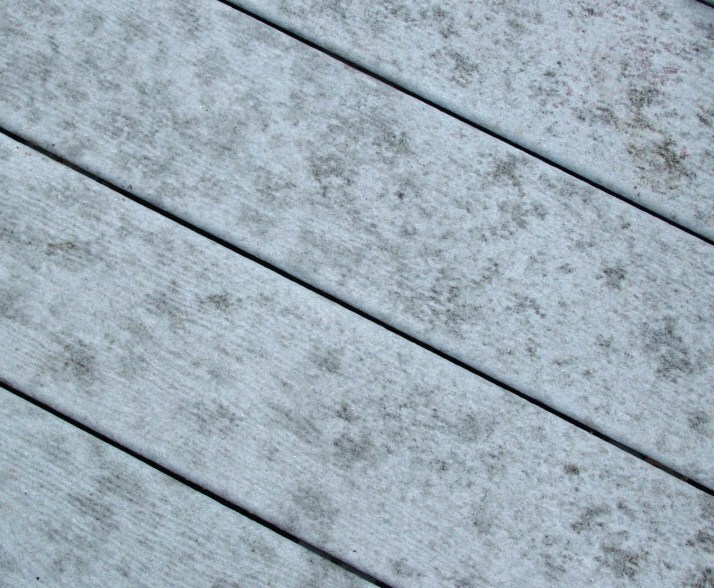 Over time, and exposure to the elements, your deck can become degraded. A poorly maintained deck is an invitation for mold and mildew to accumulate, which can cause rot. This degradation, if left to its own devices, can damage the surface of your deck and influence the structural integrity of the deck as well. From dangerous splintering to cracking and warping — each of which can lead to a domino effect of decay and create an unsafe environment for you and your loved ones. We can restore your wood to like-new condition by using our environmentally safe cleaners and protectants.Through our exclusive 3-step cleaning and sealing process to combat both time and the elements. We begin with a pre-soak foam which loosens the grime that has built up on the surfaces. Unlike outdoor cleaners that most pressure washing companies use, ours is environmentally friendly and won’t cause any damage to plants, animals or your home. This is followed by a non-damaging controlled pressure rinse. However, it is our third and final step, which truly sets us apart from other deck cleaning companies. We take cleaning and exterior surface rejuvenation, for your deck, one step further by protecting it to repel harmful outdoor elements, including UV rays. Sealing is important because it not only makes your deck look its best, it also increases the life and integrity of the wood used to build your deck. Contact us today to get your new deck, or existing deck in tip-top shape for the summer! give us a call for a free consultation at 704-944-1350 or send us an email to learn more today! Renew Crew of Charlotte the area’s choice for all your exterior cleaning needs. We do both large and small projects and clean everything from your sidewalks to your siding in one fail swoop! 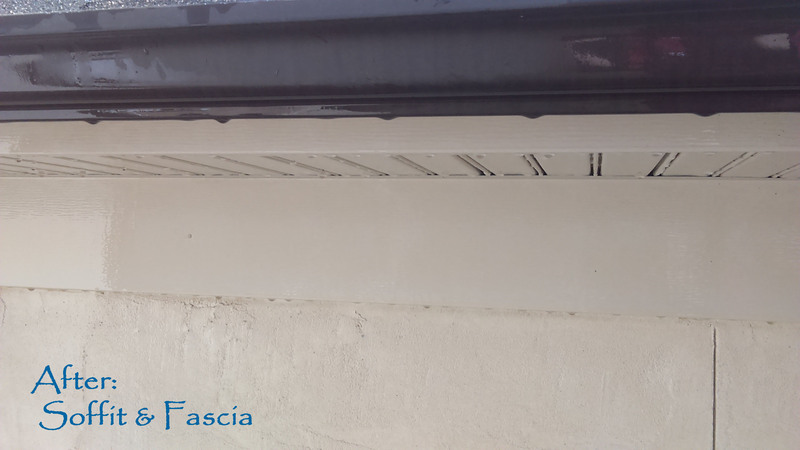 Time and exposure to the elements can cause mold, mildew, and allow dirt to accumulate on exterior surfaces, including your home’s siding, soffit, and fascia. Renew Crew has worked with chemists for almost 20 years to perfect our exclusive 3-step cleaning and sealing process to combat both time and the elements. Our process begins with pre-soak foam which loosens the grime that has built up on the surfaces. Unlike outdoor cleaners other companies use, ours is environmentally friendly and won’t cause any damage to plants, animals or your home. This is followed by a non-damaging controlled pressure rinse. However, it is our third and final step, which truly sets us apart from the rest. We take cleaning and exterior surface rejuvenation one step further by protecting it to repel harmful outdoor elements, including UV rays. The result of our 3-step process is a brighter clean than any pressure washing company can provide. Renew Crew of Charlotte makes your whole home look like new! Want to learn more about our famous three-step process? Contact us today to get your home’s exterior clean and ready for spring! (704) 944-1350. 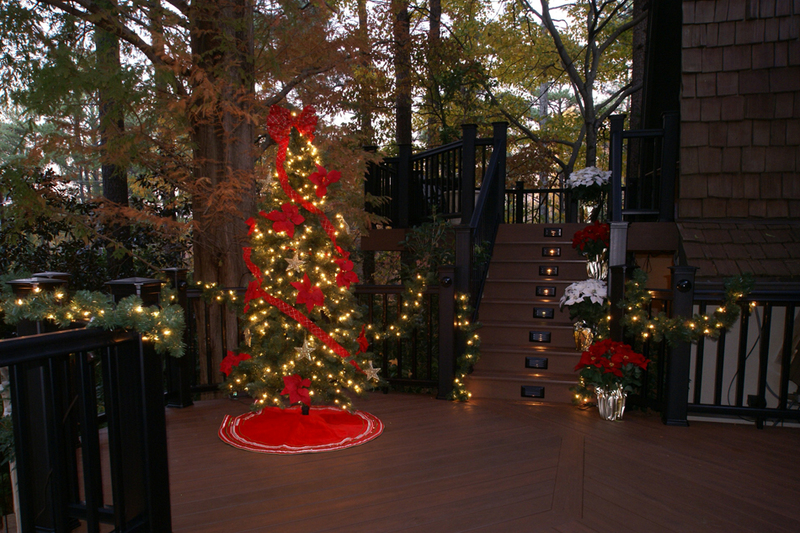 It's beginning to look a lot like Christmas, is your Charlotte home's exterior clean? Drive around in any neighborhood in the Charlotte area. Park Road, Elizabeth, South Charlotte, Ballantyne or Center City, and you will see Charlotteans busy at work decorating their homes in honor of the season. 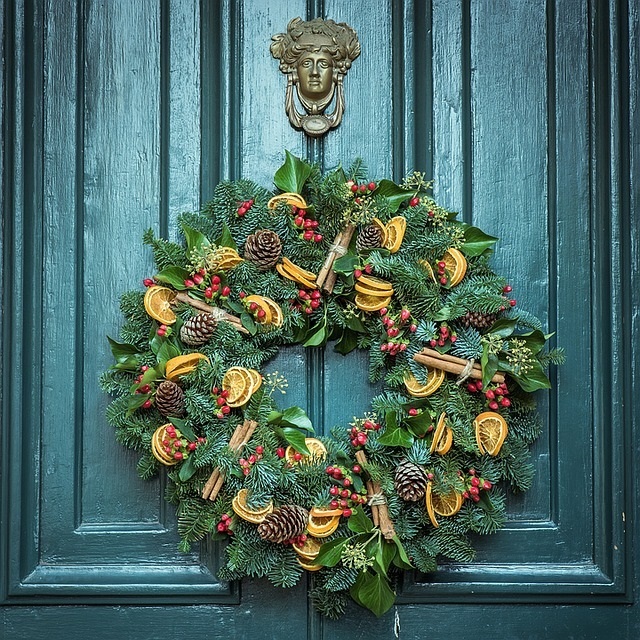 Renew Crew of Charlotte wants to know if you have given any thought to the status of your home’s exterior prior to installing holiday lights, wreaths or other outdoor decor? It might not be something you give much thought to. However, placing beautiful, festive decor onto a dirty exterior will not give you a clean base to work from and will fail to place your home in the proper light for the holidays. Much like preparing the interior of your home prior to putting up the tree or other seasonal decor, it is important to begin with a clean working area to achieve your desired results. Our talented crews are experts at cleaning ALL your exterior surfaces. Whether it is your front porch and window sills in order to hang Christmas lights, or your driveway and sidewalks to install a candy cane lined path or decor leading to your door, we can have your entire home gleaming and ready to welcome all your holiday decor. Since our exclusive cleaning system is eco-friendly, it is safe for all your outdoor surfaces. Renew Crew of Charlotte has perfected a quality exterior cleaning experience through our exclusive cleaning process to combat time, grime and the elements. We begin with a pre-soak foam which loosens the grime that has built up on the surfaces. Unlike outdoor cleaners that most pressure washing companies use, ours is environmentally friendly and won’t cause any damage to plants, animals or your home.The pre-soak foam application is then followed by a non-damaging controlled pressure rinse. All work is completed by hand to give your the best clean possible without missing details other companies miss. Contact us today at 704-944-1350 to learn more and happy holiday from Renew Crew of Charlotte! July is UV Safety Awareness Month, and in honor of the occasion Renew Crew of Charlotte wants to discuss the way direct sunlight can destroy your wooden deck and wooden outdoor structures. We also want to educate you on the proper course of action to prevent sun damage. 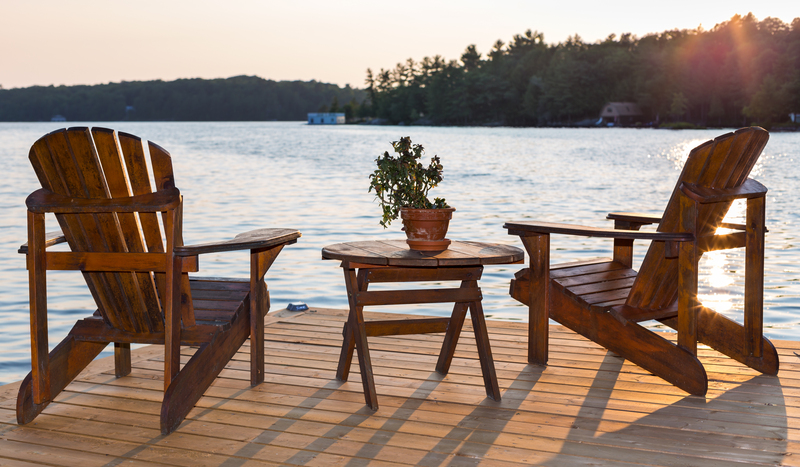 Unprotected wood will quickly degrade with constant exposure to the sun’s damaging ultra-violet rays, and this is a big problem for decks, docks, fences and other outdoor wood structure. After consistent sun exposure over one or more years, you will notice that your surface starts to turn a silvery gray—and this is a clear indication that the fibers in your wood are breaking down. If left to continue, this damage will darken and will ultimately shorten the life of any wood surface and lead to structural issues if not cleaned, stained and protected. Decks are an expensive asset that adds value to your home, so don’t go throwing good money away by not properly maintaining it. It doesn’t matter it if its pressure treated, cedar or any of the exotic hardwoods—no wood installed in horizontal/flat position can escape the damage that water and sun will inflict over time without protection. To avoid the wallop of a big repair bill or full-on replacement of your deck destroyed by UV sunlight, call Renew Crew of Charlotte to keep your investment protected on an annual basis. Heat, sunlight, rain, ice and snow are speedily absorbed by unprotected wood, and it will cause it to alternately shrink, get soft and swell due to exposure to wet and dry. This punishing cycle quickly breaks wood down and degrades it to the point where it will require a pricey repair or even a complete replacement. Renew Crew of Charlotte will help you eliminate all the headaches involved with caring for one of your biggest backyard investments, and we will take a shabby or run-down looking deck and give it a revitalized look that will add plenty of years of life. Our ecologically-friendly foaming cleansers remove years of grime and mildew and lifts off nasty dirt without harming the wood’s surface. 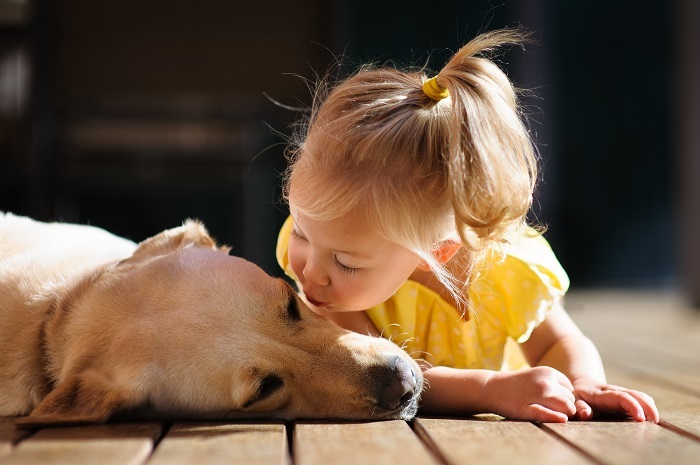 All our products are people, landscape and pet-friendly since we don’t use any noxious products like bleach. We will then stain your deck’s surface and seal it to guard against mold and mildew, the detrimental UV rays of the intense sun and other elements. You will see your has-been wood pop back to life and look almost good as new! Ongoing annual maintenance will ensure your deck can survive punishing weather and still look fantastic even after years of use. Our patented protective cleaning, staining and sealing gives you a lot more time in between cleanings and extends the life of the deck, and that makes it far cheaper than replacing bad boards or even a costly replacement. And beware of the cut-rate “man with a power washer” who puts a flier in your mailbox touting bargain services! We can’t tell you how often we’ve been called in after the fact to repair damage caused by high pressure water in the hands of a non-professional. We stand by our work and make sure it’s done correctly to give you peace of mind and ensure the durability of your backyard deck. Renew Crew of Charlotte Can Turn Your Exterior Surface Embarrassment into Pride -- Making you the Envy of the Neighborhood! How did your deck or patio look this 4th of July weekend? If you were more than a little embarrassed by a dingy and dirty exterior when friends and family visited, it’s time to give “Renew Crew of Charlotte”: http://charlotte.renewcrewclean.com/a call to take care of matters and get things clean! Don’t be faced with a stained sidewalk or driveway or a dirty fence or soiled looking siding—we can banish the grime and get your property looking fresh and revived thanks to our expert cleaning with gentle cleansers that are environmentally safe. If you deck is riddled with splinters, green with algae and mold and has been ignored for years due to poor maintenance, then it’s time to turn back the clock and get things sparkling and vibrantly transformed. 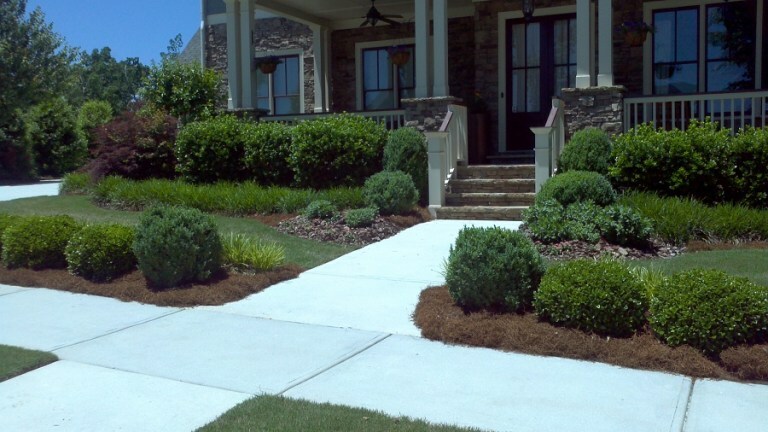 Renew Crew of Charlotte can take virtually any outdoor surface and give it a rejuvenated look that is practically good as new. We will come in and clean, stain and seal most any wood surface to protect it and extend its lifespan. 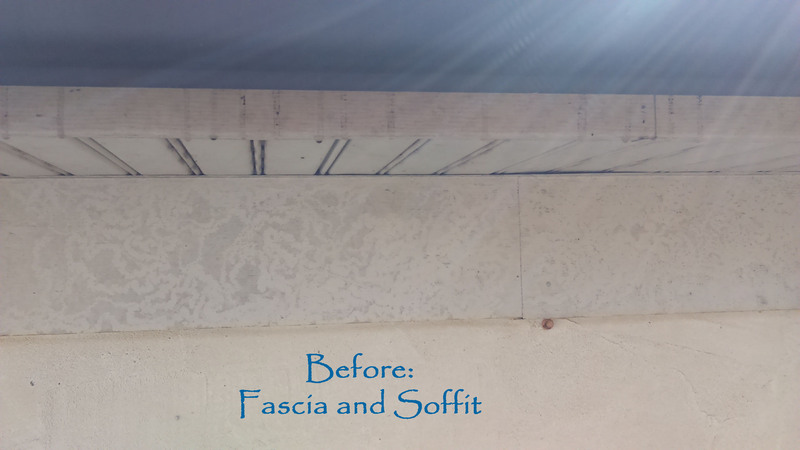 We can even clean delicate stucco siding too! Do not put your expensive surfaces into the hands of any random person with a power washer, as you risk serious damage. We are fully licensed, insured and trained to take care of your exterior structures unlike the dude that shoves a flier in your mailbox and uses a high powered washer and dangerous bleach to cheaply do the job. We don’t use any harsh and toxic chemicals like bleach that kill your landscape plants and are noxious to your kids and pets. We also don’t need to use high velocity water that can gouge, ding and put holes in your surfaces either! Our specially made, mild cleansers use a bubbling action to help lift off years of junk without the need for excessively pressured blasts of water that do more harm than anything else. We can assure you that your home and garden will not be harmed and you will have everything looking delightfully spotless. With the summer in full gear and plenty of outdoor parties and entertaining on the agenda, you can be the envy of your neighborhood with a beautifully renewed home façade, entryway, deck, patio, shed, pool deck, porch and more! We can tackle any surface in your yard that you can think of and brighten it after we remove years of icky murk and filth. You won’t have to lift a finger and can go about your everyday business while we take care of this messy job for you at a reasonable price point. Renew Crew of Charlotte will inspect all your surfaces and even make any necessary repairs that may be needed to shore things up. If you’ve got damaged or rotted boards, we can make the fix and make everything look good so you don’t have to be uncomfortable inviting guests to your home again. Don’t trust just anyone to care for the biggest investment you own and risk damage and shortening the life of your backyard structures. We will be sure to do the job right and with little impact to your home! Let us show you how we can carefully clean and your patio and deck without the use of unsafe and nasty poisonous chemicals. 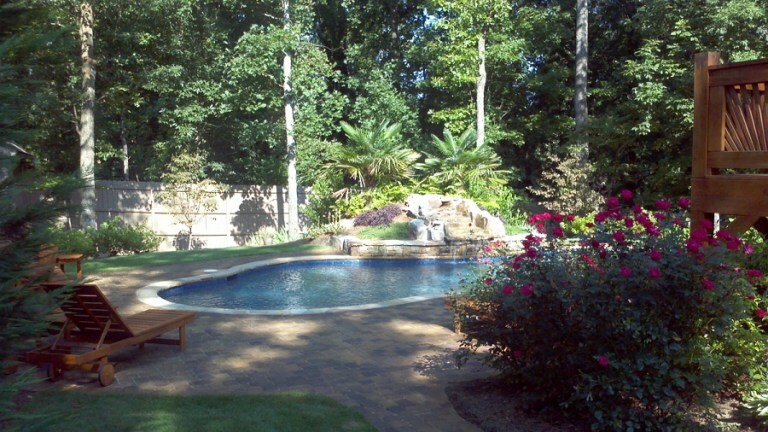 Give Renew Crew of Charlotte a call to get your ready for your next summer party! Give us a call for a free consultation at 704-944-1350 or send us an email at charlotte.renewcrewclean.com. Renew Crew of Charlotte and Archadeck of Charlotte -- the perfect recipe for outdoor living bliss! Charlotteans know us as Renew Crew of Charlotte when they see our vans zipping around town, but we are also part of the of Archadeck of Charlotte family as well. This means that we are part of a full-scale outdoor living company that has been in business over 28 years designing and building any outdoor structure you can imagine such as decks, patios, outdoor kitchens, screened porches and much more. Being a part of this amazing team means that we can clean and maintain your new or existing outdoor structure to ensure years of longevity and enjoyment. This is an immense benefit to our customers because when we see an issue on a deck, fence or outdoor building, we can evaluate it for issues when we consult for cleaning, staining or sealing it. We can give you a realistic report on its exact condition, and what might need repairs. Other cleaning companies would simply tell you that you need to find a local contractor to fix the issue, but at Renew Crew of Charlotte we can recommend Archadeck of Charlotte to take care of any issues you may be having prior to the cleaning and re-staining. We will not waste your time or money cleaning something that is in need of repair or is structurally unsound or a safety hazard for you and your family. Our competitors do not have the capacity to do this, and are only there to clean your structure. This leaves you in a quandary because why would you clean something that is in rough shape and needs a little, or a lot of TLC first? Don’t put the cart before the horse—get it done right! At Renew Crew we are able to inspect your structure before we begin cleaning it to confirm it is in tip shop shape. Once any needed repairs are made if necessary, we can then give you that sparkling clean you expect. What’s the point of cleaning something that might need some help to get rid of some wear and tear first? With our sister company Archadeck of Charlotte, we can not only build, upgrade any outdoor structure in your backyard, we can then keep is clean and maintained so that it last for years despite the sun, rain, snow and ice that pelts our area each year. That offers our customers peace of mind that they are getting complete service that is watching out for the interests of their expensive backyard structures. We can also clean and renew ALL your outdoor surfaces, not just decks and patios —We can gently clean your home siding whether it is vinyl, stucco, aluminum, etc. We can put a new face on your fence, deck, patio, shed, walkways, driveway, pool deck, pergola and more! No matter what you’ve got outdoors that is looking dingy and can use a cleaning, it is something we can tackle for you at a budget friendly price. Our foaming cleansers are mild on the environment and are not toxic to your kids, pets or landscaping. We do not use severe bleach-based products that damage wood, kill your plants and have an offensive odor that can cause negative allergic reactions. After we clean your surfaces, we can stain or paint them and then seal them for a long lasting finish so they are protected. Let Renew Crew do it right the first time so your surfaces look nearly brand new and revitalized! Let Renew Crew of Charlotte take the responsibility of maintaining your wood deck, house siding and other outdoor structures! 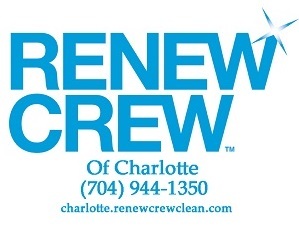 Give us a call for a free consultation at 704-944-1350 or send us an email at charlotte.renewcrewclean.com. We can help you with a build or addition to your backyard too! Renew Crew of Charlotte asks "what is in a name?" In an effort to provide the most comprehensive outdoor surface cleaning to each and every one of our clients, we have compiled a list of the services we offer, and the various names our services are sometimes referred to. Deck Cleaning: Sometimes referred to as pressure washing, power washing and according to the name used geographically in reference to the structure itself (deck), we have also heard it called sun porch cleaning and backyard deck cleaning. A deck is a deck. Though some areas of the country may call it by another name, a deck is a horizontal structure capable of supporting weight, similar to a floor, but typically constructed outdoors, often elevated from the ground, and usually connected to a building. Historically, in early deck design softwoods were used for decking and these were logged from old growth forests. These include Atlantic white cedar, redwood and Western red cedar (red cedar). Atlantic City, located in New Jersey, built the first coastal boardwalk (also called a dock or pier) in the United States, originally constructed of Atlantic white cedar. Over the years, decking materials have evolved to include many wood options, including hardwoods, as well as low-maintenance materials such as synthetics. Deck Staining: Often referred to as deck painting or deck sealing. Keep in mind, Renew Crew of Charlotte does indeed offer exterior cleaning and painting services. However, we strongly discourage the use of paint on horizontal surfaces. 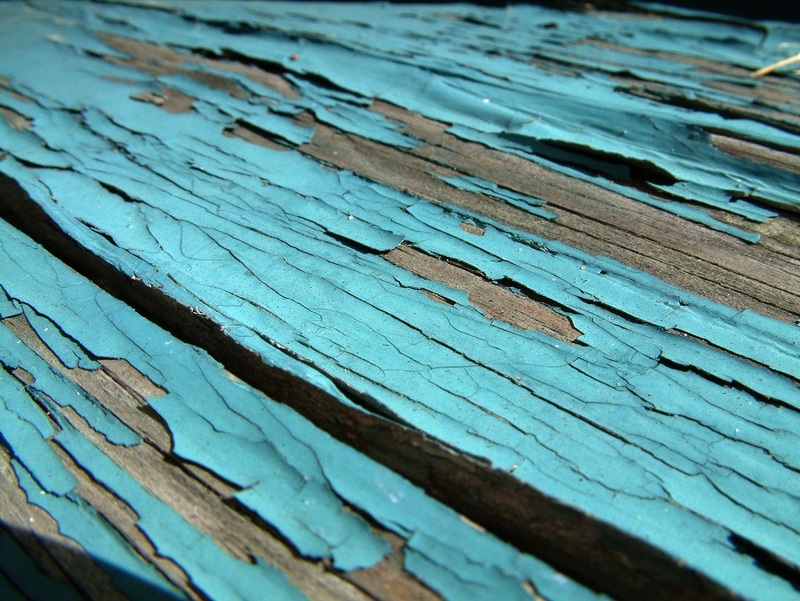 This is because paint doesn’t provide longevity on horizontal surfaces such as decks. Traffic and normal wear and tear can cause paint to peel and crack over time. The problem with painting a deck is that most deck surfaces are horizontal, so the paint just “lies” on the deck. As a result, those areas hold water. Painting, or using a solid-color stain with no sealer, will only help trap that moisture in the wood. So, as your deck boards expand and contract with variations in temperatures and weather conditions, paint begins to chip and you end up with peeling paint, rotting wood and other potential problems. Renew Crew of Charlotte does recommend use of a tinted stain for adding color to your flooring surfaces such as deck, porches, etc. A quality stain and sealer penetrates the wood grain to seal it, while also allowing moisture to escape from the wood. It won’t chip, peel or crack as the deck wood swells and shrinks. The more tinting the stain has, the better protected your deck will be from fading and moisture. Patio & Hardscape Cleaning: Patio and hardscape cleaning is sometimes called patio power cleaning, power washing or pressure washing — much the same as we often hear all our cleaning services referred to. Patios are usually built from brick, brick pavers, concrete or either natural stone such as flagstone. Cleaning brick or natural stone is no more difficult than cleaning other hardscape materials but requires expertise in order to make sure the cleaning is conducted properly. If you have a brick or natural stone patio it’s a good idea to have it sealed for protection and to make future cleanings easier. Patios that have not been sealed will require more time and effort to keep them looking clean. Patio Sealing: Sealing a patio, whether a tinted or clear sealer is applied, is sometimes referred to patio painting or tinting. With new patios we also hear it referred to as a patio finishing. Exterior Home Siding Cleaning: Sometimes referred to as house cleaning, pressure washing or power washing. Renew Crew of Charlotte cleans virtually any type of home siding including vinyl, stucco, Hardie, painted wood and brick. Our method includes application of pre-cleaning foam that clings to your siding, loosening and lifting the dirt. Then we follow up with a non-damaging pressure washing: Siding comes out sparkling clean. The next step in our siding cleaning process is a special polymer that penetrates and seals the surface of your siding to slow the dirt buildup and the debilitating effects of the elements. Rain, snow, pollution and even UV rays are repelled. The natural luster and texture of your siding are enhanced and, if it’s made of wood, our polymer brings out the grain. 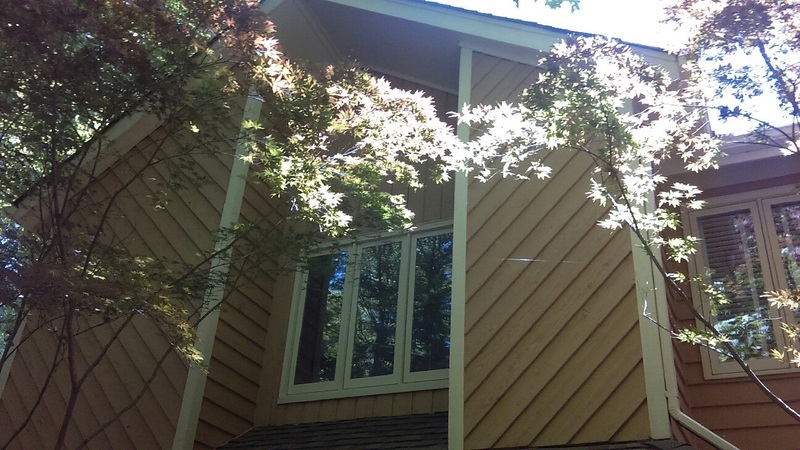 Renew Crew of Charlotte can also stain, or paint your homes siding to whatever hue you desire as a finished look. Concrete Cleaning & Sealing: Most often referred to as pressure or power washing. Pressure washing concrete is as much sculpting as cleaning, and we pride ourselves on being artists in this area. Don’t trust a yellow-page, weekend pressure washer with your property — come to the masters. Our exclusive, 3-step, modified pressure process does a better job of concrete cleaning and concrete sealing. Thanks to our revolutionary way of renewing your concrete, your driveway or patio can take on new life and stop being the eyesore it once was. Plus, with our experts on hand, renewing your concrete is botch proof! Sit back and let us transform what used to be a hassle into a breeze. Our goal at Renew Crew of Charlotte is to provide you with a superior clean on all of your outdoor surfaces. We hope the information contained in this post helps you better define the wide range of services we off. Contact us today to learn more about getting your home and outdoor spaces Renew Crew clean! Experience the Renew Crew of Charlotte Clean at Your Community or Commercial Venue! If you were thinking that Renew Crew of Charlotte only wrestles the cleaning and protection of residential homes, you’d miss out on an important facet of our business that focuses on commercial properties all around the Charlotte, NC, region. We work with many of the area’s well known businesses to ensure satisfaction with a sparkling clean look that delights your customers and guests. A great example is one of the many clubhouses we maintain around the Lake Norma area in Belmont, NC. We are tasked with ensuring that the decking to and from the water and clubhouse is always looking its best. You can believe it’s quite the feat given the constant foot traffic and the proximity to water. In this case we painted the entire clubhouse and cleaned, stained and sealed all the surrounding decking including the ramp to the dock. We offer commercial and managed properties all around Charlotte the same expert care we provide to our Charlotte’s homes. 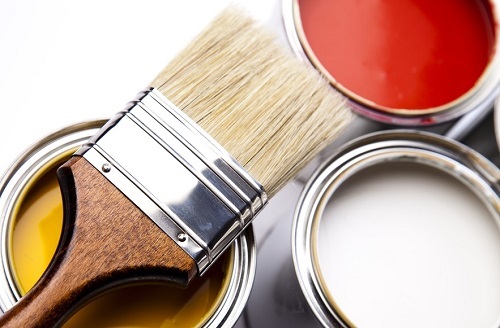 We’ve transformed many hundreds of homes and commercial and community properties to ensure they look their best. It doesn’t matter if it’s a country club, restaurant, shop, subdivision, hotel or anything else—Renew Crew of Charlotte will ensure that the results are spotless and preserved for years of hard-wearing use. As you can imagine, commercial spaces present an interesting challenge in that the volume of visitors can quickly wear down any stained surface. Our patented foaming cleaning solution gets deep down into the wood’s crevices without doing any harm to do the surface. Additionally, our special stains and paints offer a higher level of protection that is longer lasting. Renew Crew of Charlotte will attack any exterior area you or your business needs refreshed and rejuvenated with a thorough washing, staining/painting and protecting. It doesn’t matter what the structure is, we will take care of it so that it looks beautiful to your guests and customers alike. We only use our patented foaming cleansers that are environmentally friendly and safe for your family, landscaping foliage and pets. We do not utilize bleach products or any other damaging and dangerous chemicals that are noxious, foul-smelling or can aggravate your lungs. Our technicians are highly experienced, so they will not do any damage to your home or business. At the same time we will remove years of stains and grunge, then stain and seal your wood surfaces so they are protected and provide your investment with years of solid service. Winter Cleaning and Protection Now Leads to Year-Round Enjoyment of All Your Outdoor Surfaces! The weather in Charlotte, NC, has been unusual in the last month—ranging from rain, snow and ice and back to unseasonably warm temperatures.. Of course, these types of weather fluctuations can wreak havoc on decks, patios and other outdoor surfaces unless they are properly maintained. Renew Crew of Charlotte can help prevent damage from climate changes and wet weather that affect your deck regardless of what Mother Nature throws our way. If your outdoor surfaces are not properly cleaned and sealed, the changes in weather can be severely punishing to decking boards, patios, walkways, sidewalks and even siding. 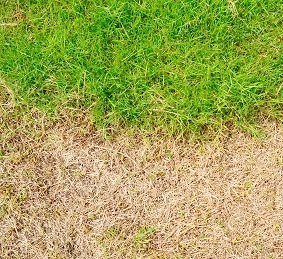 Then, as summer rolls in it packs yet another wallop with sun bleaching and damage if you do not guard your backyard surfaces and protect them. It can cost you hundreds and even thousands of dollars in repairs or even the cost of full replacement if you do not take the right steps to protect your wood, hardscape and siding right now. Renew Crew of Charlotte can not only shield your home and outdoor areas from years of dirt, mold, and even barbecue stains that can decay your deck’s look—we can remove years of grime and damage thanks to our exclusive special cleaning and sealing process. We can turn back the clock on sun exposure that has wrecked your wood; and we can eliminate the devastation that moisture creates with the growth of mold, mildew, moss and algae too. With proper maintenance, we can make these outdoor surfaces look brand new again! Our specially designed cleaning agents are formulated for wood and hardscapes to return your deck and patio to its natural beauty without damage. Our products remove years of “unkempt” looking that keeps your yard looking dingy and tired and eventually shortens the life of all your expensive outdoor structures. We get your surfaces sparkling clean and ready for a new protective coating that gets things gleaming again — and renews the excitement you and your family feel for spending time outdoors! Spring is just around the corner, so get started on improving the look of your deck, patio, driveway and other outdoor areas NOW before the season of heavy use begins. Renew Crew of Charlotte is ready to take care of the problem today so that you will be ready for spring and summer outdoor entertaining — which is only 6 short weeks away! Don’t procrastinate and put it off, it only takes a short time to get your deck back into action and have your family and friends thinking you just installed a new one. If your stained or painted deck has seen better days, we can clean it and then give it a fresh new coat of stainfor a whole new look. After we get it freshly cleaned with our foaming, environmentally-friendly solutions, we apply a water-repellent finish to protect your structure against the damaging effects of winter now and the heat of summer later. Moisture such as ice, snow, sleet and rain can penetrate an unprotected surface, which can cause splitting, cracking and warping and can lead to costly repairs. Exercising preventative care is better than a full replacement later. Our products protect against water absorption and are designed for maximum durability and protection. Renew Crew’s stains are available in both solid and semi-transparent formulas so it will keep your deck safe from damage and looking attractive for years. We are Charlotte homeowners' only choice for quality hardscape cleaning, sealing and maintenance! Savvy Charlotte homeowners already know Renew Crew of Charlotte is the only place to trust for cleaning, sealing and maintaining their upscale hardscapes, patios and outdoor living spaces. Hardscapes can encompass a significant investment and you want to make sure they are being cared for in a manner that keeps their integrity intact. This is certainly the case with new and existing hardscape areas on the exterior of your home and/or business. Here are Renew Crew of Charlotte’s recommendations for maintaining the beauty and integrity of your hardscape(s). Sealing your hardscape soon after installation will help prevent the penetration of oil, grease, leaves, and dust making regular maintenance much easier for the homeowner. Properly sealing your hardscape(s) will substantially reduce the damage caused by salt, freeze-thaw cycle and acid rain. Sealing pavers and hardscapes also help prevent moss and fungus formation and some sealers can stabilize the existing jointing sand and inhibit weed growth as well. If your pavers and hardscapes are already suffering from the elements Renew Crew of Charlotte can help. We have a proprietary line of products formulated to treat stains uniquely based on their source. After removing stubborn stains we apply a cleaner that allows us to rinse away efflorescence and ground-in dirt. The cleaning process restores your hardscape(s) back to a “like new” condition. Renew Crew of Charlotte offers several choices of sealers depending on the look you want to achieve. You can choose from matte/natural finishes to a wet look/color enhancing gloss finishes. Our professional outdoor surface specialists will work with you and guide you in choosing a product that best meets your needs. Contact us today to learn more at 704-944-1350. Wet Weather and Warm Conditions Can Lead to Mold & Mildew; Renew Crew of Charlotte to the Rescue! It’s no secret that the Charlotte area has received more than its fair share of wet weather this season. Rain continues to fall in and around Charlotte paired with unusually higher than usual temperatures. This combination of wet, humid conditions and warm weather can lead to increased amounts of mold and mildew building up on your home and outdoor surfaces. Both mold and mildew belong to the fungi family and require moisture and organic material to grow. Some molds are useful (like in cheese making or penicillin) while others can be extremely toxic. Mold can cause structural damage too. Mold can start to grow on surfaces within 24 hours and reproduce quickly. Mildew is also a decomposer of dead organic material, much like mold, and grows in wet and warm areas. Mildew can be more easily found as it surfaces quickly and in smaller patches, rather than larger infestations like mold. It can appear more powdery and white, but it can also be yellow, gray, brown, or black in appearance. Mold and mildew accumulation on your home’s siding, walkways, patios, deck and other outdoor surfaces not only looks bad, it can take make horizontal walking surfaces slippery and treacherous to use. Thankfully, Renew Crew of Charlotte has the perfect answer for ridding your outdoor surfaces of mold and mildew and helping them stay clean for longer periods of time. Ordinary pressure washing can leave mold, mildew and embedded dirt untouched. That’s why Renew Crew of Charlotte employs exclusive solvents that penetrate deep, loosening grime from pores that typical power washing or pressure cleaning can miss. Commercial pressure washing services simply can’t provide the superior concrete cleaning, deck sealing, etc. you’ll enjoy with Renew Crew. A simple pressure washing company does not have access to Renew Crew’s proprietary cleaning compounds and sealing polymers. These were developed and refined exclusively for Renew Crew of Charlotte. Neither you nor any pressure washing company can purchase these exclusive formulas in any store. At Renew Crew of Charlotte, we know that your home’s outdoor surfaces are more than just an investment — they’re a showcase. That’s why we’ve invested years of research in developing eco-friendly cleaning compounds that, when paired with a controlled pressure cleaning, lift dirt, mold and mildew away and enhance your surfaces’ natural luster — despite Mother Nature. Contact us today at 704-944-1350 to learn how to keep your home and outdoor surfaces clean and protected through every season! Our recent project in South Charlotte proves Renew Crew of Charlotte is the ONLY company for your exterior surface needs! Renew Crew of Charlotte recently completed a total exterior transformation on a home located in the South Charlotte/Matthews area. As you probably already know, we are the local experts for exterior surface cleaning, staining and sealing and power washing. However, our talents exceed the expertise of other exterior renovation companies in the area because of our diverse menu of options, including exterior home staining and painting. One of our most recent projects demonstrates not only our talent in exterior surface restoration, but also the versatility of our menu of services. 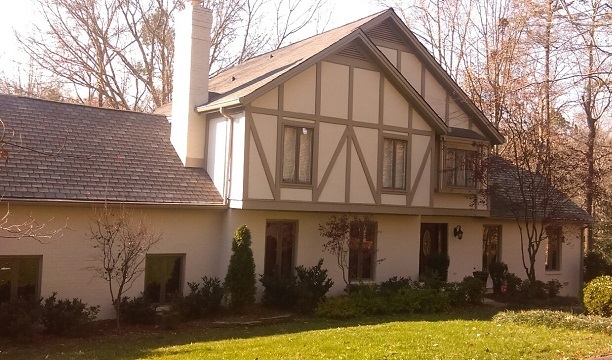 On this particular project, we totally transformed the exterior of this English Tudor style home located in the South Charlotte area near Matthews, NC. The home’s exterior consists of stucco, aluminum and brick. Renew Crew of Charlotte cleaned the entire facade of the home and repainted in the color chosen by the homeowner. They say a picture is worth 1,000 words — this couldn’t be more the case than when explaining the dramatic impact our services can make on the appearance of your exterior outdoor surfaces. Renew Crew of Charlotte offers a wide selection of services to make the outside of your home sparkle. This includes deck cleaning, staining and sealing, concrete cleaning including driveways and sidewalks, pressure washing, patio and hardscape cleaning, gutter cleaning, siding cleaning and even exterior painting and staining. 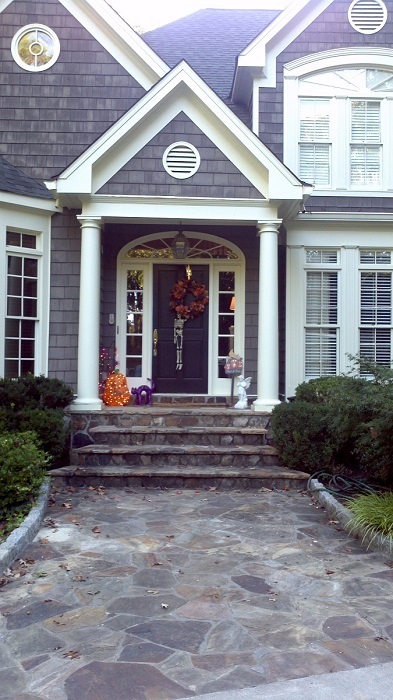 Let Renew Crew of Charlotte Make Your Home's Exterior Sparkle for the Holidays Ahead! The holiday rush is here and you’ve got a lot to take care of before family and friends come knocking. A dingy home exterior is the last embarrassment you want to face, so let Renew Crew of Charlotte give you an amazingly clean home façade and exterior that shows your holiday guests you take pride in your home. We can make your home, deck, patio and fence gleaming before you hang up your holiday lights and décor. We can come in and get your home done in a less than a day in most cases and then you can adorn your home and exterior with holiday decorations and twinkling lights. We will give you the perfect clean slate to showcase your home for Hanukah, Christmas, Kwanzaa and New Year’s festivities! • All your exterior surfaces! When visitors arrive they will appreciate the look of your deck or patio that will look practically new when Renew Crew of Charlotte is done doing our magic. We will leave everything looking refreshed and protected so that all your exterior surfaces are winter-ready. Your house, outdoor surfaces and hardscapes will look beautifully maintained and impressively fresh. We will remove every trace of mildew, grime and mold from every nook and cranny so that you don’t have to fuss with anything and go about your holiday with ease. Book now before our appointment schedule fills up! Renew Crew of Charlotte will tackle any exterior area you need revitalized with a thorough washing. We will take care of your house, patio, driveway, sidewalk, fence, pool deck, garage, shed and any other outdoor structure that needs to look its best before guests arrive. We only use our patented foaming cleansers that are environmentally-friendly and safe for your family, landscaping and pets. We do not use bleach or any damaging chemicals that are toxic, malodorous or can irritate your lungs. Our techs are trained to pay special attention to your home and outdoor structures thanks to our gentle cleansers that do not require high pressure washers to get the task done. When they are done removing years of grime, we can stain and seal your wood surfaces so they provide you with years of service. Don’t think for a moment that cleaning thousands of square feet of a home and other structures is an easy task for the average homeowner. If you don’t know what you are doing, you risk damaging your property, landscaping and potentially falling as you scale a treacherous ladder to get to your eaves or the higher floors of your home. You may think you are getting off cheap doing it yourself, but a repair or replacement bill or a trip to the hospital due to a fall is certainly no way to have fun for the holidays. Let the experts at Renew Crew of Charlotte handle this tough task why you enjoy your winter hot cocoa with the kids. Call Renew Crew of Charlotte today to get on our holiday cleaning appointment list. Don’t wait until the last minute to get your home twinkling clean for the winter season. Give us a call for a free consultation at 704-944-1350 or send us an email today! When I think of the methodology behind our power washing technique here at Renew Crew of Charlotte, I automatically begin to hear the chorus from the classic 1979 song by Nick Lowe “Cruel to be kind” play out in my mind. The reason for this is because so many other pressure washing companies assume you have to use a high PSI in order to achieve successful exterior surface cleaning results, when this is certainly NOT the case. 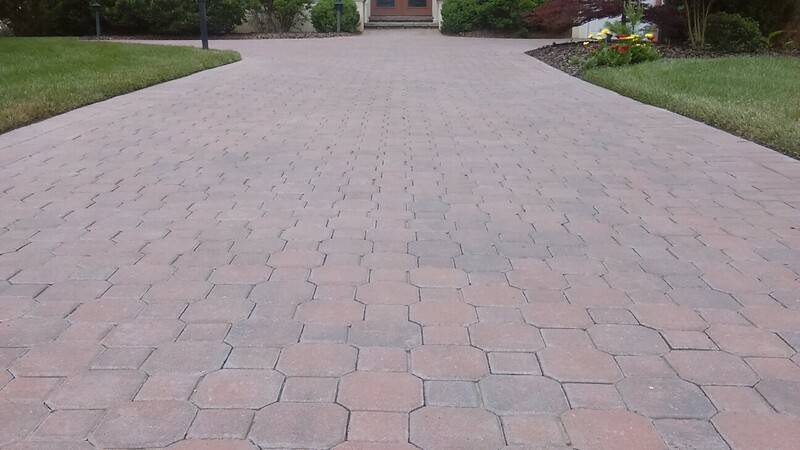 To retain the integrity of your surface, whether it is a wooden deck or fence, the siding on your home, concrete driveway or even a paver or stone sidewalk, requires a “kind” approach to this vital step involved in surface cleaning. 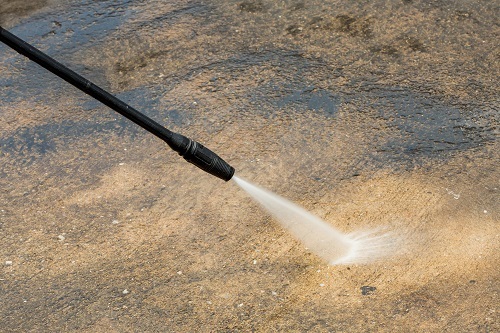 Traditional pressure washing can leave embedded dirt within the nooks and crannies of your outdoor surfaces untouched. That’s why Renew Crew of Charlotte employs exclusive solvents that penetrate deep, loosening grime from pores that power washing or pressure cleaning can miss. After our special solvents bring the dirt and grime to the surface, our professionally trained technicians then wash it away with our special gentle power washing technique. At Renew Crew of Charlotte, we know that your home’s outdoor surfaces are more than just an investment — they’re a showcase, and a reflection of you. That’s why we’ve invested years of research in developing eco-friendly cleaning compounds that, when paired with a controlled pressure cleaning lift dirt away and enhance your surfaces’ natural luster. A standard power cleaning uses unnecessary brute force to blast dirt away, but it doesn’t penetrate to kill mold and mildew, or scour away deep-seated grime. Worse yet, if the amount of pressure used or the angle of the cleaning is just a little off, the pressure cleaning could take gouges out of your siding, decking, driveway or mangle nearby plants. Our eco-friendly solutions will kill mold and mildew without harsh chlorines that can damage your surfaces and kill your plants. And your exterior surfaces will stay clean longer thanks to special polymers that seal and protect against grime and the elements. Commercial pressure washing services simply can’t provide the superior concrete cleaning, deck sealing, etc. you’ll enjoy with Renew Crew at Charlotte. A simple pressure washing company does not have access to our proprietary cleaning compounds and sealing polymers. These were developed and refined exclusively for Renew Crew. This means that neither you nor any pressure washing company can purchase these exclusive formulas in any store. If you are ready to get your outdoor surfaces looking their best while maintaining their integrity, contact Renew Crew of Charlotte, and remember your power washing company doesn’t have to be cruel to be kind on your outdoor surfaces! You can reach us at 704-944-1350 or send us an email at to learn more today. 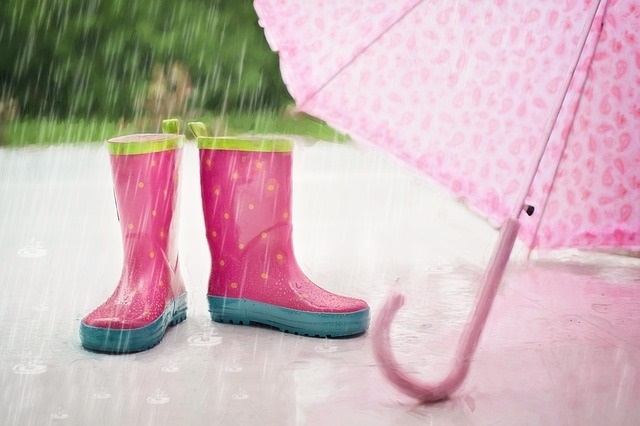 With Renew Crew of Charlotte, rainy days & Mondays will never bring you down! You may think it is impossible to have your outdoor surfaces cleaned and renewed during the rainier seasons of the year, but this is a common misconception. 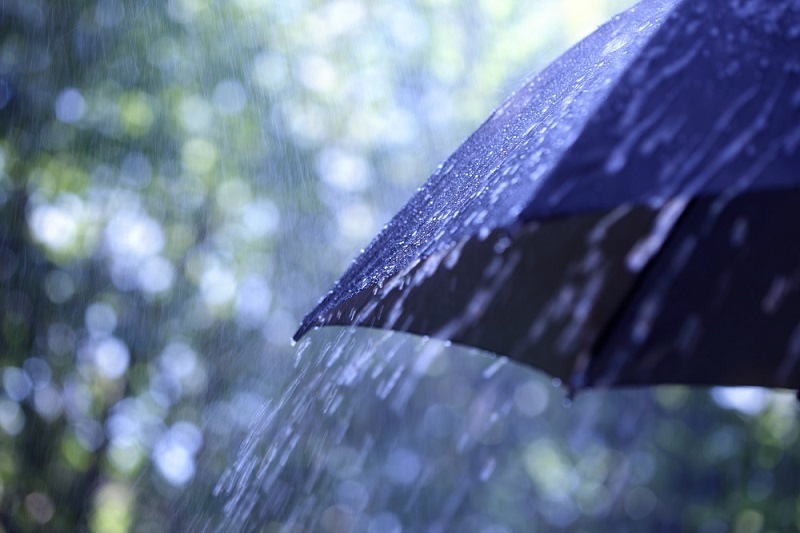 In lieu of the deluge of rainfall that has recently occurred in the Carolinas we feel it is important to address the logistics of how wet (or inclement) weather can contribute to a pause in moving ahead with cleaning your outdoor surfaces. Why put off what Renew Crew of Charlotte can do today? The truth is when it comes to the time period needed for a successful deck, patio, siding or other exterior cleaning project to take place we adhere to the 24/24 rule. This means in order for your deck or other outdoor surface to receive a Renew Crew of Charlotte clean your outdoor surface only needs to be free of rain for 24 hours, and once we have completed your cleaning and sealing it only needs to remain free of rain for an additional 24 hours. That is a total of just two days which means now would be the perfect time to move ahead with your outdoor surface renewal plans so your home and outdoor spaces are sparkling clean in time for the holidays ahead! In addition to having your humble abode looking its best, our exclusive 3-part process protects your deck, patio and outdoor space from the wrath of Mother Nature as we look ahead to the inclement winter weather. Having your surfaces properly cleaned and sealed prior to the arrival of winter provides a barrier against rain, ice and the mold and mildew that can accumulate and cause damage to your outdoor surfaces — our sealers protect your deck in much the same way an umbrella keeps you protected on a rainy, winter’s day! Before the chill in the air turns into harsh winter weather, clean and protect your deck to prepare it for the long winter months ahead. Contact Renew Crew of Charlotte to winterize, renew and protect your outdoor surfaces. Give us a call for a free consultation at 704-944-1350 today! We would also like to mention our neighbors in South Carolina who have experienced a catastrophic amount of rainfall in recent weeks. Our thoughts and prayers go out to all residents in these areas as we come together for strength, patience and a time to rebuild. Let Renew Crew of Charlotte help clean & restore your outdoor surfaces to make them ready for the season! Let’s face it, a dazzling clean home exterior is a great invitation to friends and family who are visiting, and it even makes the neighbors smile. 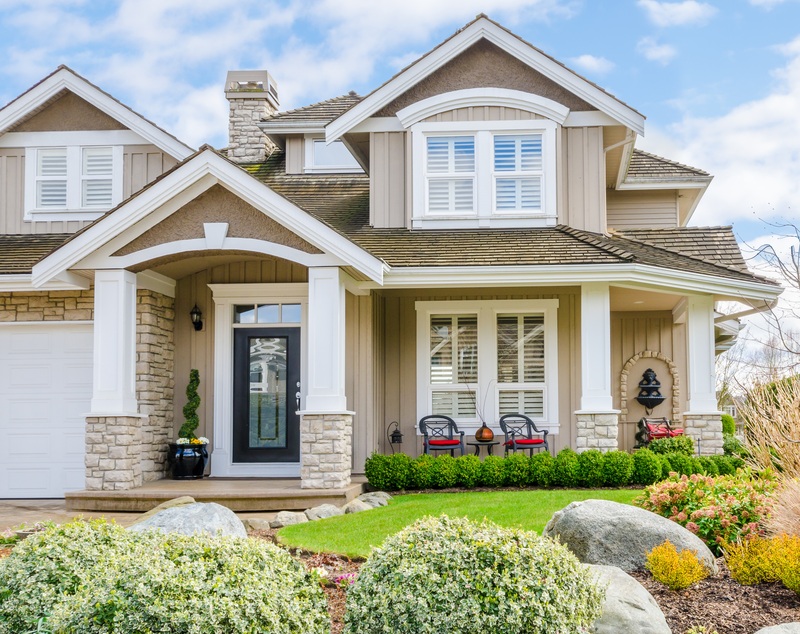 You can be proud to stand in front of your property when your home’s siding, front entrance, sidewalk, driveway, deck and outdoor spaces are sparkling clean and looking vibrant. After all, who wants to stare at a dingy and dull house on the block where things look unkempt? Autumn has officially arrived and that means family and friends will be coming to call as we move toward into the holiday season! The period of October through January is the “most visited” (and busiest) time of year for most households. In October Halloween arrives, and so do friends, neighbors, family and those sweet trick-or-treaters; in November Thanksgiving arrives and so will your dinner guests for a time of giving thanks and making memories; and of course, in December Christmas arrives and that means there will be holiday gatherings and guests to come-a-knocking at the height of the holiday entertaining season! With all the extra traffic converging on your home, you want to ensure your outdoor surfaces are sparkling clean. This includes your driveway, sidewalks, home’s exterior, entrance and your backyard structures too! When visitors come over they will enjoy sitting on your deck or patio where everything looks fresh and new. They can huddle around your outdoor fireplace or fire pit with a hot cocoa and admire your beautiful property that is clearly being maintained. We are so lucky that Charlotte weather in the Carolinas affords us plenty of outdoor time well into the fall. We can host an outdoor barbecue and cheer for our Panthers during a Sunday afternoon football game while friends are digging into hotdogs and hamburgers outdoors. Show off a sparkling clean property without mildew, grime and mold in every corner. Best of all, you can hire Renew Crew of Charlotte to do it right and take the task off your hands. Renew Crew of Charlotte can have your sidewalks, siding, deck, patio, driveway, fence and any outdoor structure looking spiffy before the big Thanksgiving dinner. Our patented foaming cleansers are environmentally-friendly and safe for your family, landscaping and pets. We do not use bleach or any harmful chemicals that are noxious, smelly or can irritate your respiratory system. Our technicians are specially trained to prevent damage to your home and outdoor structures. We can also stain or seal your wood surfaces as well so that they provide years of extended use. Beware of the untrained home cleaners that knock on your door and use harsh chemicals and high pressure washers to do the job. It’s terribly damaging, unsafe and nasty on the environment. Why risk the health of your family and pets, jeopardize the structures of your home which can be splintered, pitted and ruined by improper cleaning. This can shorten the life of your siding and outdoor structures and even cause the need for early replacement. Unlike our competitors, we stand behind our work and ensure you are satisfied. If you think you can tackle the massive job of cleaning your own home—think twice! Reaching up high onto a second story on a dangerous ladder to clean peaks and gutters is not something someone unqualified should be doing. If you don’t have the proper equipment, cleansers (not harmful bleach as many advertise) and good technique, you risk damaging your property and potentially falling and getting hurt. Let us take all the hard work out of it and do it quickly. Putting off the task only prevents necessary maintenance to prolong the life of your home and outdoor structures. 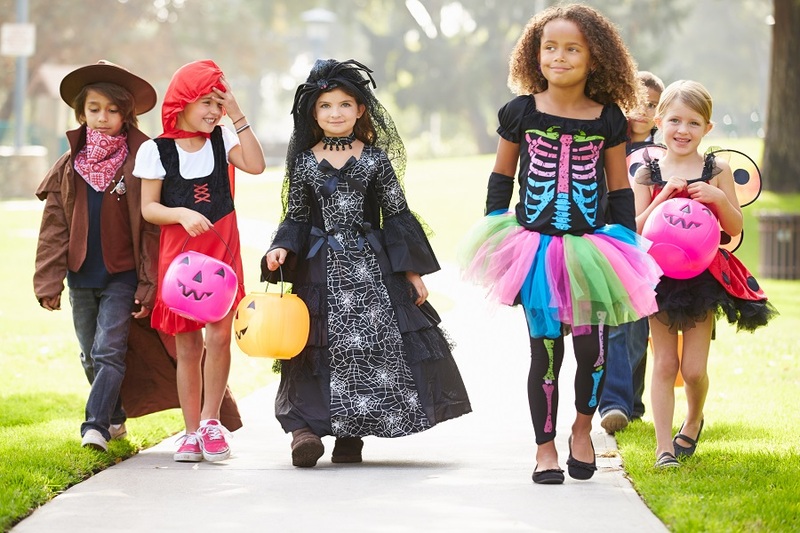 The holiday season is fast approaching starting with Halloween in a few weeks, so visitors will inevitably end up at our doorstep and will be checking out your home whether you like it or not. Before you put up your holiday decorations and lights be sure to start with a clean slate and have your home professionally cleaned. It’s the perfect time to book an appointment before our schedule fills up! Contact Renew Crew of Charlotte to learn more about our keeping your outdoor surfaces looking for all your exciting upcoming holiday events and impress all your guests!! Give us a call for a free consultation at 704-944-1350 today! Renew Crew of Charlotte to participate in open house at Archadeck of Charlotte! What are your plans for this weekend, the first official weekend of fall 2015? Archadeck of Charlotte is holding an open house and all our wonderful brands will be there to discuss your outdoor living, remodeling, surface cleaning and renewal needs! Including Archadeck of Charlotte, Value Remodelers & Handyman Services and Renew Crew of Charlotte. 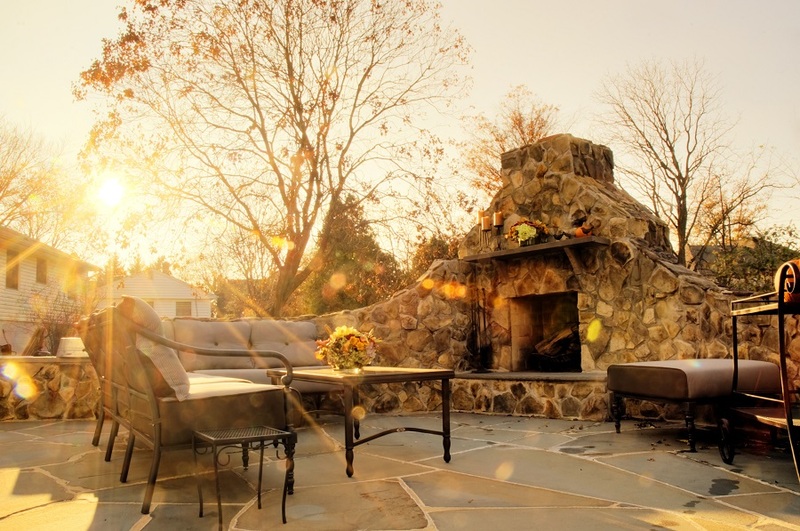 Autumn is the perfect season to improve upon your existing outdoor spaces, consider a new outdoor space addition or finally tackle that remodeling project you’ve been longing for. At Renew Crew of Charlotte, we pride ourselves in providing a comprehensive cleaning and protection service that our clients love. We clean decks, patios and other hardscapes, siding, sidewalks, fences, driveways and much more! Our 3-step cleaning & sealing process starts with pre-soak foam. Unlike outdoor cleaners that most pressure washing companies in Charlotte use, ours is environmentally friendly and won’t cause any damage to plants, animals or your outdoor surfaces. Come join our open house this Saturday September 26th from 10AM – 4PM. Our indoor/outdoor showroom is located at 2311 Village Lake Drive, Charlotte, NC. Come by for a tour, to enjoy some food and drink, or just to browse our showroom and get some ideas. We look forward to seeing you Saturday! Renew Crew of Charlotte will be at the Southern Ideal Home Show Sept. 11-13th, stop by and say hi! With only a few more weeks before autumn arrives wouldn’t it be great to have you outdoor surfaces looking their best? Renew Crew of Charlotte is here to help. We use an exclusive, eco-friendly 3- step process to provide our clients with the cleanest outdoor surfaces possible.This includes your home’s deck, siding, patio, gutters, driveway and walkways — we can get the job done professionally, saving you time and aggravation. Over time, exposure to Mother Nature can cause mold and mildew, and allow dirt to accumulate on exterior surfaces. Renew Crew has worked with chemists for almost 20 years to perfect our exclusive 3-step cleaning and sealing process to combat both time and the elements. It starts with pre-soak foam which loosens the grime that has built up on the surfaces. Unlike outdoor cleaners other companies use, ours is environmentally friendly and won’t cause any damage to plants, animals or your home. This is followed by a non-damaging controlled pressure rinse. However, it is our third and final step, which truly sets us apart from the rest. We take cleaning and exterior surface rejuvenation one step further by protecting it to repel harmful outdoor elements, including UV rays. We’d love to show you how Renew Crew of Charlotte is helping Queen City residents bring their home’s exterior surfaces back to life. The Southern Ideal Home Show returns to Charlotte this weekend and we’re going to be there too — so be sure to come see us. As one of this area’s leading home improvement events that’s all about the home, inside and out, this event is the one every homeowner should make sure they don’t miss! Show dates and times are Friday: 10am-8pm,Saturday: 10am-7pm and Sunday: 11am-5pm at The Park Expo and Conference Center, members of our team will be on hand to answer any questions in booth #411 and #418 along with Archadeck of Charlotte and Value Remodelers of Charlotte. We pride ourselves in providing a comprehensive cleaning and protection service that our clients love. Be sure to attend this spectacular home event and we’ll show you how choosing Renew Crew of Charlotte to revive your home’s exterior will make it like new, longer. We look forward to meeting you at the show. You can also reach us at 704-944-1350 or via email at charlotte.renewcrewclean.com to learn more about all the exterior surfaces we clean and renew through our proven cleaning and restoring process. Renew Crew of Charlotte can turn your home's dingy entry into dynamic! Being in the business of exterior home cleaning and restoration, it is not uncommon to arrive at a potential clients’ home for a deck cleaning consultation and proceed to ring the doorbell only to notice mold and mildew accumulation on their front stoop, or front entry to their home. Keep in mind, if we notice it, guests and visitors that enter your home through the front door are probably noticing it too. The good news is Renew Crew of Charlotte is so much more than just a deck cleaning company. We specialize in cleaning, renewing and maintaining all your home’s outdoor surfaces including siding, sidewalks, driveways and yes even the front entry (or stoop) of your home! Mold, mildew and even moss can be a constant battle to keep at bay on the front stoop of your home, especially if the surface is constructed of brick, stone or pavers. Renew Crew of Charlotte realizes that your brick, stone and hardscapes are an investment, and we can keep your investment looking new and maintained. Our 3-step cleaning process that Renew Crew has employed for the last 20 years combines pressure washing services with a gentle hand. Renew Crew of Charlotte utilizes a specialty foam, designed to spread into any and all crack and crevices, including the grouted areas of your front stoop that are prone to facilitate mold and mildew.This foam soaks in deep, allowing dirt, mold and mildew to adhere to our solution. This solution, once set, is rinsed away with our controlled pressure washing system. With Renew Crewof Charlotte, your surfaces won’t be “blasted,” causing damage like traditional pressure washing. Our system is controlled at a steady rate, ensuring the foam, dirt and mildew is lifted, without the classic gouges that power washers can leave. 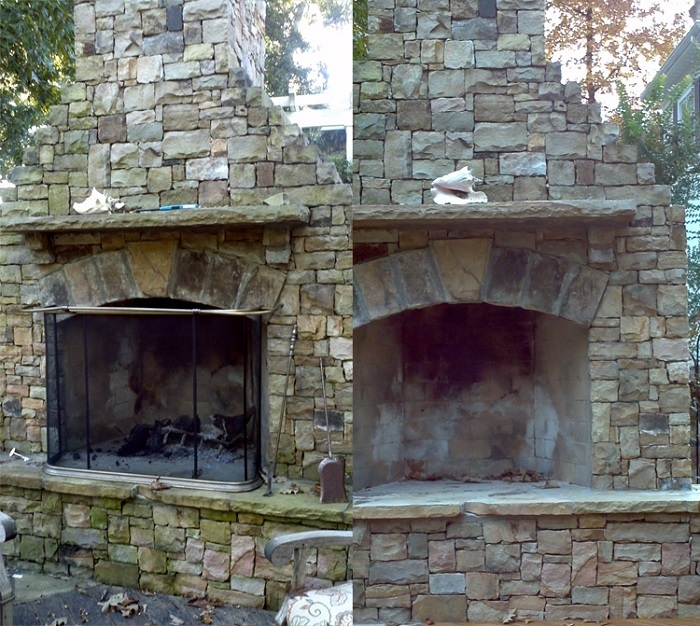 Just look at the difference the Renew Crew of Charlotte clean can make! Once rinsed, we also apply an eco-friendly sealant solution. This solution prevents your exterior surfaces from the classic signs of aging. Fading from the sun is eliminated with the UV-blocking properties in our ingredients. This sealant also acts as a barrier, to prevent that dirt, grime and mold from building up so quickly. This means that not only will your outdoor surfaces be clean, they will remain clean much longer than usual. 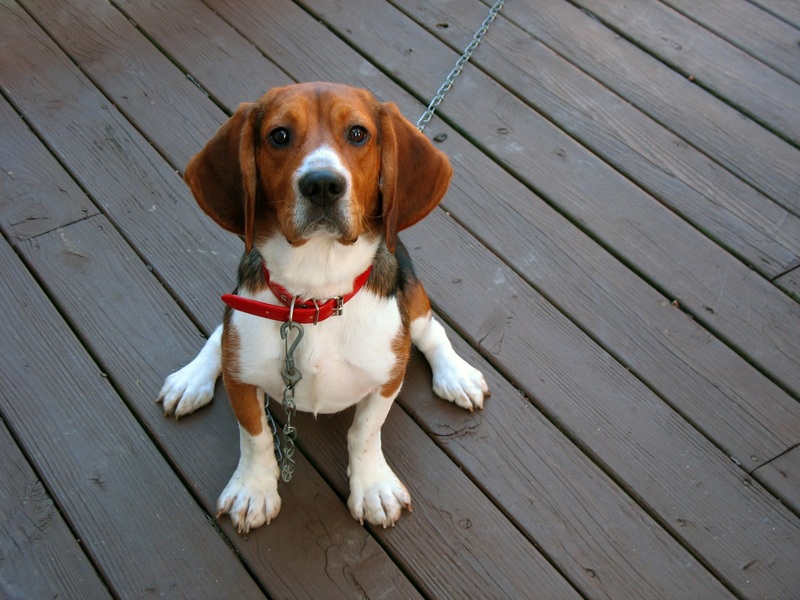 Has your deck cleaning company gone to the dogs? Our products are eco and pet-friendly! The term “gone to the dogs” is defined as something that has gone wrong or lost all the good things it had. This is an idiom we have heard used by many customers who have used a “fly by night” or inexperienced deck cleaning or surface renewal company that did not provide a satisfactory level of service or even caused damage to their structure during their project. We have seen home siding with large holes and decks virtually ruined by a power washer with too high a PSI level and the wrong chemicals (like harsh bleach) used with disastrous results. Harsh chemicals can kill your landscape, bleach out the wood on your deck, and harm a wood plank to the point that it is permanently gouged and splintered which can result in hundreds or even thousands of dollars in repairs later. Here at Renew Crew of Charlotte, we strive to be the best at what we do which is exterior surface cleaning and protection. Our highly effective three-step process lifts built-up outdoor dirt, mold and grime and brings it to the surface where we can wash it away leaving your outdoor surfaces not only clean but protected! We specialize in cleaning wooden and composite decks, outdoor structures, hardscape and stone structures such as patios and sidewalks, gutters, driveways and even the siding on your home. Renew Crew deck cleaning before and after — amazing! Our exclusive proprietary 3-step pre-foam, power clean and protection process is safe and eco-friendly to the surrounding landscape, your family and your beloved pets, we can assure you that our patented solution to eradicating years of grime and mildew growth is safe. We utilize a foaming cleaning agent that carefully removes nasty grime without harming the wood planks. We don’t use any dangerous chemical products such as bleach that can ruin your prized plants, shrubs and flowers and can harshly decolorize your wood and damage your patio. Renew Crew’s sealer specially guards your deck against mildew and mold, blocks UV rays of the sun which can lighten wood and cause it to dry out, and protects from the harsh winter effects too. Renew Crew can tackle cleaning wood, concrete, brick and even composite materials in a eco-friendly way that is family, pet and landscape friendly. Contact Renew Crew of Charlotte today to learn more about our keeping your outdoor surfaces looking great year after year! Give us a call for a free consultation at 704-944-1350.